Days later in Moniqa’s apartment . . . .
“What are you thinking about?” Xiah asked Iqa as he gently caressed her hair. She was lying on his lap while he was sitting comfortably on the sofa. “Well . . . . I’ll just tell them that I fell in love with you . . . . That is the only explanation I can give them . . . .” he said with a smile. “Silly . . . . they will surely be more upset if you do that,” she replied. “How about you? Aren’t you scared of what your manager and Sony Music will say?” he suddenly asked back. “Because . . . . the very first thing I demanded from Sony Music when I was still signing a contract with them is that they can never interfere with my love life . . . . I can be in a relationship whenever . . . . wherever . . . . and with whomever I want. And they agreed to it . . . . It’s also written in my contract. So they can’t really object if I have a relationship with you . . . .” she replied with a laugh. “That’s good . . . . I’m very much relieved to hear that . . . .” Xiah said while smiling. “Do you know you’re so cute . . . . when you’re smiling like that?” Moniqa asked as she stared at Xiah. “I know . . . . I know I’m totally irresistible . . . . and naturally born very cute,” he replied with a grin. “Really?’ she asked then she started to laugh. “Yes . . . . that’s why a lot of girls just love me . . . ” he replied again with a grin. “You’re quite conceited . . . .” she said as she started pinching Xiah. Xiah laughed as Moniqa lightly pinched him. “So better prepare yourself . . . . you will always get jealous . . . . because a lot of girls always ran after me . . . . .” he said again as he laughed. Xiah suddenly moved away from Moniqa. . . . and she quickly ran after him, trying to pinch him anywhere she could get her hands on. Both of them laughed so hard, as they both ran around the room. They were both very happy. They were like little children playing around in the park. They both laughed and giggled happily. After almost fifteen minutes of playing around, Xiah and Moniqa were already both very exhausted. They both sat on the sofa again to rest. Moniqa snuggled close to Xiah. She was resting her head comfortably on his chest. She could hear his heart beat as she lay so close to him. Xiah gently caressed Moniqa’s head. “Why are you so quiet all of a sudden?” he questioned. “Do your friends know? I mean . . . do the other members of your group know about your feelings for me?” she asked. “Nothing . . . .I was just thinking about what they’re going to say . . . .” she replied. “Why are you always so concerned about what others will say?” Xiah asked. “Because . . . . that’s the way we all are . . . . We are artists . . . celebrities . . . We always think about others first, before we think about ourselves,” she replied. “Honestly . . . . I don’t care about what others might say. All I care about is you. I love you and i will do whatever it takes to always have you by my side,” he said lovingly. “You’re so sweet . . . . Is your twin brother as sweet as you?’ Moniqa asked. “No . . . . I’m much more sweeter . . . . and much more cuter than him,” Xiah replied with a laugh. Moniqa laughed. She was very happy . . . . that she somehow was able to forget her problem. “How about Se7en and Masao? Do you think they will approve of me?” Xiah suddenly asked. Moniqa looked at Xiah . . . . “You don’t have to worry. Se7en already helped you remember? And as for Masao . . . . he is always skeptical about every guy I go out with . . . . But then he always gives in to what I want. So he will like you too . . . . Don’t worry. . . . I will make sure they don’t eat you up alive,” she said as she laughed continuously. “I love you . . . . Iqa . . . . I will endure anything as long as you are with me,” Xiah suddenly said as he embraced her. “I love you too . . . . And I am willing to go through hardships just for you. . . .” she said in response to him. “But I really want to tell you something. . . . But promise . . . . you won’t laugh. . . okay?” he said with a smile. “I . . . . I . . . . I am very jealous of you and . . . . Se7en,” Xiah said shyly. “I know . . . . I shouldn’t be jealous . . . . But I can’t help it. . . . Whenever I think about the way you and Se7en . . .Aaaahh! . . It just makes me so jealous that my whole body trembles .. . .” Xiah said. “Yes . . . I know that but I can’t help myself . . . . I am really affected whenever you are so close to him,” he said with a sad look in his eyes. Moniqa embraced Xiah tighter. She wanted to make him feel how much he meant to her. “You don’t have to be jealous . . . . There is only one person that I love right now . . . . . and that is you,” she uttered. Xiah was deeply touched by what Moniqa said. He was very happy that he felt he was very fortunate to have met her and having her in his life. “Sorry . . . . I just wanted to get that thought out of my mind . . . .” Xiah uttered. “It’s okay . . . . I understand . . . .” she replied with a smile. “I just love you so much that I am afraid that I will lose you to another guy . . .” Xiah confessed. As Moniqa said those words . . . . her heart started to pound. “I love you . . . .You will never lose me to another man . . . Xiah . . . But to fate . . . . I am really not so sure . . . . . I wish I can tell you everything about me . . . . But I am afraid that if i tell you the truth, it will only make our remaining time together filled with sadness. So I am sorry . . . . if I am keeping secrets from you . . . I only want to leave you with happy memories . . . .” she said in her mind. “What are you doing?” Masao asked Se7en as he slowly shook his head as a sign of disbelief at what he was seeing. “Drinking . . . .” Se7en softly answered as he sipped a glass of whisky. “You just gave Moniqa to another man . . . . and now you’re here trying to drown yourself in a bottle of whisky . . . . Isn’t that a little too pathetic?’ Masao asked. “So what if she likes him? You like her too . . . . But being the very foolish guy that you are . . . .you just decided to set aside your feelings again . . . . And to top it all, you’re even the one who pushed Moniqa to tell him how she really feels. Sometimes I wonder if you’re really a man . . . . If I were in your position, I would have taken advantage of your closeness with her . . . . And by this time . . . I would have made her my girlfriend . . . .” Masao said in an irritated tone. “You and I both know that she likes him . . . We can both see it in her eyes . . . And ever since from the start, all I want is for her to be happy . . . . even if it means seeing her with another man . . . .” Se7en said sadly. “You’re really hopeless . . . .” Masao uttered. “She had already given up hope after she broke up with Akira . . . But now . . . . she’s more determined to find a cure for herself since she has Xiah to think about,” Se7en told Masao. “But honestly . . . . do you think she will ever get a suitable heart donor? It’s been two years . . . .and the ones the doctors get her always doesn’t match. Frankly . . . .I am starting to think whether those doctors are really doing their jobs,” Se7en said irritatedly. “Hey . . . . It isn’t the doctors fault . . . . They are doing the best they can do to help her,” Masao said with a sigh. “There are millions of people in the whole world and they can’t find a single compatible donor. . . . Now that is pathetic!” Se7en said as he poured himself another glass of whisky. “Does Xiah know about Moniqa’s condition?” Masao suddenly asked. “No . . . Moniqa doesn’t want him to know about it. I think she will be hiding it from him as long as she can . . . .” Se7en replied. “Silly girl! Why would she do that?” Masao asked as he shook his head. “She doesn’t want him to pity her and she doesn’t want him to leave her like what Akira did . . . . ” Se7en replied again. “Akira? Akira is a total fool! Why would Xiah leave Moniqa if he truly loves her just because she’s sick . . . .” Masao uttered angrily. “Masao loved Moniqa . . . . but he left her as soon as he learned that she is sick. He didn’t want a dying lover in his hands . . . . We can’t deny the fact that some men are like that . . . .” Se7en said as he continuously drank the glass of whisky that he was holding. Se7en slowly looked at the glass that he was holding. It was already empty. . . . then he suddenly laughed. “I am not afraid to have a dying lover . . . . if only she would want to have me . . . . That is the main point of it all . . . . I would gladly accept Moniqa . . . . But the question is . . . . ‘Will she accept me?’ . . . . So you see . . . . it is quite complicated,” Se7en said with a bitter smile. “Complicated? I don’t think so. You’re the only one who is making everything complicated . . . .” Masao replied. Se7en took the bottle of whisky on the counter table . . . . Then he poured himself another glass . . .
“Are you really trying to get drunk?” Masao asked angrily. Se7en looked at Masao with a fake smile. “Who? Me? Drunk? No . . . . I am not drunk . . . .” then he laughed out loud. Se7en was already drunk. He had already drank a couple of beer in a club he had gone to. “Four bottles and what? . . . . You’ve already drank half the bottle of whisky . . .” Masao said again. “So do you think . . . . Moniqa will ever get her operation done?” Se7en asked seriously all of a sudden. “I hope so . . . . We both love her . . . . But in my case . . . . I only love her as a sister . . ..” Masao answered. “I love her? Yes! I love her . . . . . I love her . . . . I love Moniqa . . . . I love Moniqa . . . .” Se7en started to say as he twirled around the room. He was already drunk and he wanted to play around. Se7en looked at Masao . . . . Then he started to laugh. “I have loved her for the past four years. . . . I love her with all my heart . . . .I love Iqa . . Why doesn’t she love me back? . . . Am I that unlovable? I love her and she doesn’t even know . . . .I love her . . . . I love . . . Iqa . . .” Se7en suddenly looked at the direction that Masao was looking at. He was shocked at what he saw. Moniqa was standing right in front of him near the door, with her eyes wide with shock. She had obviously been standing there long enough to hear everything that he had said. “Moniqa . . . .” Se7en uttered. “Dong-Wook . . . .” Moniqa said in a low voice. She was very much surprised with what she had found out. Se7en who was drunk awhile ago suddenly snapped out of his drunkenness. He didn’t know what to do and what to say to her. He was already looking at Moniqa’s shocked expression. Somehow he knew that everything was going to change now . . . . now she already knew that he had feelings for her. “Moniqa . . . .Please let me explain . . ..” Se7en said as if pleading. Moniqa looked at Masao then at Se7en. “I . . . . I . . . . I’m sorry but I think I have to go . . . .” then she quickly ran out of Masao’s house. Se7en hurriedly ran after her. He wanted to explain. . . . He wanted to clear everything that she had heard. “Moniqa . . . . wait! Please!” Se7en shouted as he ran after Moniqa. They were already outside the house. Moniqa suddenly stopped running and turned to face Se7en. Tears were already streaming from her eyes. “Moniqa. . . .” he uttered. “Why do you have to fall in love me?” she suddenly asked. “I can’t answer that question Iqa. . . . . It is like you’re asking me why do I have to breathe . . . . ” Se7en answered. “Dong-Wook . . . . I . . . .I’m quite confused right now . . . .” she said softly. “Moniqa . . . .I guess it’s time I tell you the truth . . . .I have loved you for four years now . . . . ” Se7en said with a serious look on his face. “Se7en . . . . ” Moniqa uttered. Slowly Se7en approached Moniqa and then he embraced her tightly. “I just want to hold you . . . . not as a brother . . . . not as a friend . . . . but a man . . . . a man who loves you . . . .” Se7en uttered. Moniqa didn’t know what to say . . . . or what to do. . . . He pitied Se7en. She knew he was in pain. She wanted to comfort him. She then slowly embraced him back. Se7en could feel the warmth of Moniqa’s body . . . .and it was somehow bringing a strange sensation that he had never felt before. Slowly . . . . he lowered his head to find Moniqa’s lips . . . . lips that he had wanted to kiss for a very long time now. Moniqa was surprised with what Se7en did. She was totally frozen. It was as if she couldn’t move. “Moniqa . . . .” a voice called out. Se7en immediately released Moniqa from his kiss and his embrace. And as they both looked at where the voice came from. . . . they were both faced with the sad and hurt look on Xiah’s face. “Xiah . . . .” Moniqa uttered. But as Moniqa tried to approach Xiah . . . . he quickly turned away. “Xiah . . . .Please let me explain . . . . Xiah . . . .Xiah!” Moniqa called out with tears in her eyes. But Xiah had quickly gotten into their van and had immediately asked the driver to go. Moniqa helplessly watched as the DBSK boys’ van moved farther and farther away. “Xiah . . . .I love you,” she uttered again as her tears continued to flow. Xiah was very silent while the van was on its way back to their apartment. He was with the other DBSK members. They had also seen the scene with Se7en and Moniqa. He wasn’t sure what he was feeling at that exact moment. The only thing that he could think about was the scene that he had seen. It was like a movie that kept on repeating in his mind. As soon as the DBSK boys arrived at their apartment, Xiah had hurriedly went to his room. “Hyung . . . . ” Max had called out. He was trying to stop Xiah from entering his room. But he had already gone in and had immediately locked the door. “It’s better if we leave him alone . . . . for now. He needs some time alone to think . . . . ” U-Know said seriously. “I’m starting to think that all girls are the same . . . . a girl makes a guy fall in love with her, but the moment . . . . another guy comes along, she ditches the first guy for the second guy . . . .” Micky said irritatedly. “Hey! That’s unfair . . . . Not every girl is like that . . . . and besides . . . . in Moniqa’s case . . . . we all saw what happened . . . .” Jaejoong said. “And besides what? We all saw that Se7en embraced her and kissed her,” Micky said. “Just like you had said . . . . Se7en embraced her and kissed her. It wasn’t Moniqa who started it,” Jaejoong tried to point out. “But still the fact remains that she didn’t object to it. She didn’t try to stop him. She just stood still while Se7en kissed her . . .” Micky said angrily. “How can you react when you’re shocked?” Max suddenly asked. He was obviously trying to point out Moniqa’s side. “Why is it that I feel that all of you are trying to defend her?” Micky asked the other DBSK boys. “Because . . . . we also want to be fair with Moniqa . . . hyung . . . . We all know that she also loves Xiah. And we don’t really know the whole story . . . . So we can’t judge her that so easily . . . .” Max said to Micky. “We all don’t want to see him hurt . . . . But the only one that can help him now is himself . . . . He has to learn how to deal with this all on his own. He must learn to accept what he saw and forgive . . . .” U-Know said with a serious expression on his face. “But frankly I don’t think Iqa is to be blamed. She was just a victim . . . .” Max said with a sigh. “Victim? I guess . . . . she is kind of a victim too,” Jaejoong said helplessly. “What are we going to do with hyung?” Max asked (pertaining to Xiah). “Nothing to do . . . . but leave him alone, I guess,” Micky answered. “Should we talk with Iqa?” Max asked again. “No. . . . . we mustn’t interfere . . . . Let them settle this all on their own,” U-Know said to the other DBSK members. Max looked at U-Know. He didn’t agree with what he was saying, but there was nothing that he could do. “Maybe things will be fixed in a couple of days . . . . Just give them some time,” Jaejoong said again. “I just hope that they will be able to talk to one another again after this . . . .” Max said. “You’re right . . . . I hope hyung will try to talk with her again . . . . so they can clear everything up . . .” Max said. “The best thing we can all do now is just keep quiet and let him be . . . .” U-Know said. After several days . . . . The DBSK boys were already having breakfast when the doorbell rang. Max hurriedly stood up to open the door. And within minutes, he entered again with Moniqa behind him. Moniqa looked at the other DBSK boys sadly. She didn’t know how they boys felt about her and she certainly didn’t know how Xiah would react to her. “Hyung . . . . someone wants to talk with you . . .” Max said. Xiah looked at Max and then at Moniqa. There were mixed emotions in his eyes. But what made Moniqa scared was the hatred that she saw in his eyes. “Xiah . . . . Please . . . . Can we talk?” Moniqa asked in a low voice. Xiah stared at Moniqa as if looking right through her. “No!” Xiah answered as he suddenly stood up and left the dining room. Moniqa’s heart was silently crushed as Xiah just carelessly passed her by . . . . .it was as if she didn’t exist. Slowly her tears fell . . . . one by one . . .
“Xiah . . . . Xiah . . . ” Moniqa uttered as she suddenly broke down into tears. The DBSK boys didn’t know what to do. They could see and feel that Moniqa was hurting badly. And they all pitied her. Somehow Micky’s perception about her changed the moment he saw her cry. Now they all knew that Iqa truly loved Xiah. And the only thing that they hope now is that Xiah will learn to forgive and try to clear everything up with Moniqa. They didn’t want to see both of them suffer . . . .
“It’s all right Iqa . . . . Everything will be all right. . . . Please don’t cry . . . .” Max said as he tried to calm down Moniqa. “Why won’t he talk with me? I want to explain . . . .” she softly uttered. The DBSK boys didn’t know what to answer. Moniqa silently left the DBSK boys’ apartment with a broken heart. She was very hurt that Xiah still didn’t want to talk to her. Now she was starting to wonder if he truly loved her as much as she did. Moniqa sadly climbed onto the car that was waiting for her. Then she looked at Se7en who was sitting next beside her. Moniqa just shook her head. Then she suddenly broke down into tears again. Se7en just held her in his arms as he gently caressed her head. “I’m sorry . . . . I know it is all my fault . . . . I should have just kept my feelings to myself,” Se7en said sadly. she said as tears flowed down from her eyes. “Iqa . . . . you know that I love you and no matter who you are with and no matter what you do . . . . I will always be here for you . . . .” Se7en softly said. “I know . . . . I know . . . .” she uttered as she rested her head in his chest. She was still crying . . . . crying for the love that she knew she was going to lose. The next day . . . . . the DBSK boys had just arrived at their studio when their manager suddenly told them a good news . . . .
“Boys . . . . I know you will all be excited by what I am going to tell you,” their manager said with a big smile on his face. “What? Come on tell us, hyung,” Max said with a smile as well. “Well . . . . Sony Music has invited you boys to be guest performers in Moniqa and Se7en’s concert,” their manager had announced with a big smile on his lips. “What?” Micky, Jaejoong, Max and U-Know all said in unison. They were all shocked with what they learned. Xiah just stared at their manager with an expressionless face. He was totally unable to think straight. He didn’t want to see Moniqa and especially Se7en of all people. He sighed heavily. He had been successful in avoiding Moniqa for the past week and now it seems even fate is against him. Now he was going to be forced to face her and Se7en because of the concert. Xiah could feel that he didn’t have the strength to confront Moniqa and Se7en. He was still very hurt and he wasn’t ready to listen to any of their excuses. All he could think about was the fact that Moniqa had cheated him. “Hyung . . . . Why are we suddenly being put into their concert?” Max asked surprisingly. “I don’t know either . . . . but it is a request from Sony Music so basically Avex Trax and SM Entertainment just accepted. So you guys will be very preoccupied this coming two weeks for the preparations and the rehearsals for their concert,” their manager said again. “What are we supposed to do in their concert?” U-Know asked suddenly. “You will be performing at least five songs for the concert,” their manager answered. “When is their concert scheduled anyway?” Micky asked. “Their concert will be in two weeks,” the older man answered. “So where are we going to rehearse?” U-Know asked. “You will be rehearsing together with Moniqa and Se7en in their own studio. It is better that way so you will be familiarized with the way their concert is to be done. And so you will also have the chance to get acquainted with one another, since you will all be working with one another. Well . . . . I know it isn’t needed anymore since all of you are already friends with one another. But the company presidents have insisted that all of you try to work with each other during the preparation period,” their manager said again. “So when is our rehearsal with them going to start?” Jaejoong asked. “As a matter of fact . . . . It is supposed to start today . . . .You will all be brought to their studio now . . . .” the older man said again. “What?” Micky asked again with the surprised look on his face. “Why is it you’re like rushing us into that concert all of a sudden . . . . You only tell us about it today and now we are supposed to go to their rehearsal all of a sudden?” U-Know asked with a confused look on his face. “Come on guys . . . . Be good. This is a big opportunity for you. Sony Music is a very big company. You should feel very proud that they are requesting you guys to perform in one of their concerts. What’s the problem? Why are you guys opposing it so much?” their manager curiously asked. “Nothing . . .” Jaejoong quickly answered. “Yeah . . . . Nothing . . . .” Max also answered. “Well . . . . better prepare yourselves. We are going now in a few minutes,” the older man said with a smile. The other DBSK members all looked at Xiah. He didn’t even say a single word. He was just listening and was staring blankly into open space. The boys’ manager suddenly noticed Xiah. “What’s wrong with him?’ he asked the other DBSK boys. Micky and Max just shrugged their shoulders. They didn’t want their manager to know what Xiah’s real problem was. It was already afternoon when the DBSK boys with their manager arrived at Sony Music’s Studio. “So this is the place . . . .” the boys’ manager exclaimed as they arrived. The DBSK boys just looked at the place and vaguely smiled. Max, Micky, Jaejoong and Micky were all thinking about Xiah. They were very concerned with how he was going to react once he saw Moniqa and Se7en again. The DBSK boys quietly entered the studio. As Xiah entered . . . . his heart was pounding very hard. He wanted to turn back and just walk out of the studio. But he knew he couldn’t do it. He had to face his fears. He had to face Moniqa and Se7en . . . . he constantly told himself as he went inside. As soon as Xiah and the other DBSK boys entered the studio . . . . all the people immediately turned to look at them. Moniqa and Se7en were in a corner, resting. They didn’t notice the boys as they entered the room. Se7en was sitting comfortably on the floor while Moniqa was resting her head on his lap. He was gently caressing Moniqa’s hair as they sweetly talked with one another. Xiah’s heart suddenly stopped beating the moment he saw Moniqa and Se7en together in such an intimate position. The other DBSK boys stared at Xiah. He was looking at Iqa and Se7en. It was very obvious that he was hurting because of what he was seeing. The boys wanted to just drag Xiah away. They wanted to protect him from the pain . . . . that Moniqa and Se7en were giving him. “Hyung . . . . are you all right?” Max asked Xiah as he gently tapped him on the shoulder. Xiah had been staring at Se7en and Moniqa for the past five minutes. Everyone in the room were already conscious of what was happening. “Se7en . . . . Moniqa . . . .DBSK is here . . . .” one of the staff called out. Se7en and Moniqa both looked at the DBSK boys. It was only then that they noticed the boys. They immediately approached the boys to greet them. “Hello . . . .” Se7en said coldly. “Hi . . . . .” Moniqa said with sadness in her eyes. Then she slowly looked at Xiah who was staring at another direction. He was obviously avoiding to look at her. Moniqa smiled bitterly. She had expected Xiah to avoid her. But it was still breaking her heart. Se7en saw the hurt look in Iqa’s eyes. He was angry with Xiah that he was treating Moniqa in such a cruel way. “Come on Iqa . . . . Time for practice . . . . ” Se7en said as he gently placed his arm around Moniqa’s waist and pulled her away. Moniqa just let herself be pulled away by Se7en. She was feeling very lost and totally lifeless. It was like her body was there but her entire being was somewhere else. “Please . . . . . don’t let him see that you’re very affected. Have some pride, Iqa” Se7en softly whispered in Moniqa’s ear as they walked away. She knew Se7en was right. But she couldn’t do anything. She was truly feeling hopeless . . . . At that moment, she wanted to cry. She wanted to release the sadness she was feeling. Se7en saw the tears that were forming in her eyes. He immediately wiped them away. Then he asked one of the staff members to start the music that they were going to dance. As the slow music started . . . . everyone’s eyes were focused on Se7en and Moniqa. Xiah didn’t want to look but he couldn’t resist. He wanted to see how Moniqa and Se7en danced. He wanted to see if they were really perfect for one another. He wanted to see if she truly belonged to Se7en now. He wanted to see the truth . . . . even if it hurt him. As Se7en gently held Moniqa in his arms and they started to dance intimately, Xiah couldn’t help but feel pity for himself and sad as well. Now he can see that Se7en really fitted well with Moniqa. He fitted her more than he will ever do in this lifetime. He slowly turned away. It was already hurting him so much. He couldn’t take it anymore. He had already admitted defeat. He no longer believed in the word ‘love’. “I’ll make you forget him,” Se7en softly whispered to Moniqa as they danced. Moniqa just stared deep into Se7en’s eyes. And even though she was looking at him . . . . all she could see was Xiah’s face. Two days later . . . .
Everybody were very busy with the preparations for the upcoming concert. “Okay . . . . everybody . . . . dance rehearsal is over for now . . . Se7en, Moniqa and DBSK will be having their rehearsal for their songs in a little while . . . . Please prepare . . . ” one of the staff members announced. The DBSK boys looked at Se7en and Moniqa sitting in a corner of the room. They were talking with each other. There were times they would catch Moniqa staring at Xiah. They could see the sadness in her eyes, and it made them pity her very much. Ever since their rehearsal started, Xiah had been constantly avoiding Iqa. He wouldn’t even look at her. Many of the other staff members and dancers both from Sony Music and Avex Trax were already very confused. They already noticed that Xiah and Moniqa haven’t talked with each other ever since the rehearsals started. And all of them could see that he was avoiding her deliberately. “What’s wrong with Xiah and Moniqa?” the DBSK boys’ manager asked U-Know. U-Know looked at Xiah. And then he gently shook his head. He didn’t want to say anything. “Everybody is already making a big fuss about their cold treatment with each other. Where is Xiah anyway? He was here a moment ago . . . . Where did he go?” the older man said to the other DSBK members. Jaejoong and Micky started to look at each other. “Maybe he just went out to . . . . to . . . .” Micky tried to find a perfect alibi for his friend. “Maybe he went with Max . . . .” Jaejoong said with a smile. “Yeah . . . . Max went out to get something he left in the van,” Micky lied. Their manager looked at the DBSK boys. He knew that they were trying to hide something. But he just to let it go. He didn’t want any problem. “There he is . . . .” U-Know said as he pointed to Xiah who just arrived with Max. “Where have you boys been?” their manager asked angrily. “We went out for a while,” Max answered. “For what? You know that rehearsals are going to start . . . .” the older man said again irritatedly. “Sorry . . . hyung,” Max apologized. “Okay . . . . Just get ready . . . . And Xiah . . . . what is wrong with you and Moniqa? You still have more than a month before . . . . you know what . . . . So even if you are already starting to get on each other’s nerves . . . . just try to pretend. Smile . . . and act that the two of you are lovers . . . . I know that it may be already very hard with you . . . . But for your sake . . . please try to bear with it a little while longer,” the older man said to Xiah. Xiah stared at their manager. He wanted to say something, but somehow the words wouldn’t come out of his mouth. Then finally after several minutes . . . . he was finally able to say what was on his mind. “I . . . . I . . . . I don’t want to pretend anymore,” he softly said. “What?” their manager asked with shock in his eyes. “I can’t stand it anymore . . . .” Xiah said with desperation in his eyes. “Xiah . . . . This isn’t the right time and place to discuss that . . . that matter,” their manager said with a nervous voice. He was very afraid that someone might hear what he was saying. “But I . . . . . I . . . I want to break up with her already. I’m sick and tired of her,” Xiah had suddenly said with a loud voice. He was already feeling agitated and very much confused. Everyone in the room suddenly looked at Xiah. All of them had obviously heard what he said. They were all surprised by what they learned. They all stared at Xiah . . . . afterwards they all looked at Moniqa. They were all hoping to have some kind of answer from looking at her. Moniqa and Se7en who were also in the room, also heard what Xiah had said. Moniqa was stunned . . . . her mind was already spinning and her heart was slowly breaking into tiny pieces. She never expected that Xiah would do such a thing. She was very hurt . . . but she still tried to control her emotions. Suddenly the officer of Sony Music entered the room. “Please start the rehearsal . . . . Moniqa. . . . ” he said. Se7en was very shocked . . . and angry at Xiah. How he wanted to confront him with how he was treating Iqa. Xiah was hurting her very badly and he wanted to help her. Moniqa looked at Xiah’s direction. Tears were starting to form in her eyes. But she tried very hard to hold back the tears. She didn’t want their rehearsals to be affected. She was trained to be a professional artist. She had to put her responsibilities first before anything else. Slowly Moniqa went to the center of the room and started to play the piano. Sadness was very visible in her eyes as she started to sing . . . . . Somehow Iqa couldn’t control herself anymore . . . . and slowly her tears started to fall one by one . . . . . But she just continued to sing. Everyone in the room who were watching her felt like their hearts were all being torn into pieces. They all could feel her sorrow and pain. Se7en couldn’t stand seeing Iqa so down . . . . he suddenly stood up and walked up to where she was and spontaneously embraced her in front of so many people. He wasn’t going to let Moniqa get hurt ever again. . . . He was determined to protect her and take care of her . . . . no matter what the consequences were. He was going to be responsible for her and he was going to love her . . . . without any conditions. The DBSK boys, Moniqa and Se7en with their respective managers were all waiting anxiously for the decision of the four companies . . . . SM Entertainment, Avex Trax, YG Entertainment and Sony Music Entertainment were going to make regarding the sudden scandal that Moniqa, Se7en and Xiah were in. The press had somehow gotten a picture of Se7en embracing Moniqa during the rehearsal that they had a day before. The picture was already printed in all the major newspapers and magazines, and was already making a big commotion in the entertainment industry. “What do you think they will say?” the DBSK boys’ manager asked Moniqa’s acting manager. “Frankly . . . I have no idea,” the other man answered. “I just hope they won’t cancel the concert because of this . . . .” Se7en’s manager said with a sigh. Moniqa and Se7en sat beside each other and just stayed quiet. They already knew that there was really going to be a big problem after they saw the picture on the newspaper. The picture had also been posted in different sites in the internet. It was truly a big news and they knew they had to be responsible for the problems that may arise from it. Slowly Se7en took Moniqa’s hand and held it. The three managers just looked at Se7en and then at Moniqa. “I know . . . . sooner or later . . . . you two would fall for each other. But I never expected that your relationship would be this complicated . . . .” Se7en’s manager told Se7en and Moniqa as he shook his head. “Sorry . . . .” Moniqa uttered. “It’s okay . . . . I understand that the two of you have known each other for years now . . . . And frankly, I’m quite amazed that it took you guys this long to finally admit that you are more than friends,” Se7en’s manager said again with a smile. “Hyung . . . what do you think they will demand this time?” Se7en asked his manager worriedly. “Don’t worry . . . . I already know how Sony Music always favors Moniqa. So I think they will surely go easy on the two of you . . . . and I think this thing between you and Moniqa will also be a big help for your concert,” Se7en’s manager answered. “But . . . . this isn’t a promotion for our concert,” Se7en said somehow annoyed with his manager. “I know . . . but I just think it will help a lot for your concert. Many of your fans are already waiting a formal statement regarding your true relationship,” the older man said again with a smile. Se7en looked back at Moniqa. He was feeling very sorry. He wanted to comfort her and assure her that everything will be all right. She was obviously very worried as well. She was totally not herself and just stared into the open space. “Why? Don’t worry . . . . They will surely go easy on you,” Se7en said to Iqa while he held her hand tighter. He wanted to attract her attention and draw away her thoughts from the person he knew she was thinking about. Moniqa stared at Se7en. . . . then she smiled. “I’m not worried about myself . . . . I’m more concerned with what the companies will do with you and . . . .” she suddenly stopped talking and then looked at Xiah. Xiah was still trying to look at his friends. He avoided staring or even glancing at Moniqa and Se7en. He was trying to pretend that he didn’t care at all. “You don’t have to worry about him . . . . He obviously doesn’t care about you anymore. So don’t waste your time and energy on him,” Se7en whispered to Moniqa. Iqa just gave a quick glance at Xiah’s direction and then she turned her attention again at Se7en. She suddenly sighed. She was very hurt . . . .how she wanted to talk with him and clear everything up. But he just kept on avoiding her calls and even when she tried to talk with him personally, he would just find some other excuses so that he would be too preoccupied to talk with her. The DBSK boys just stared at Moniqa as she sat beside Se7en. They were feeling the tension as all of them waited for the decision of the three record companies. They also felt that Xiah wasn’t even concerned with what was going to happen to him. He was obviously more concerned with hiding and denying his true feelings for Moniqa. The DBSK boys could see that he was very hurt and jealous of Moniqa and Se7en. But he just tried his best to cover it with his anger. He was also trying to pretend that he wasn’t affected with what was going on between him and Iqa. He tried to give everyone fake smiles to cover everything up. He had totally lost all his happy and bright smiles, and all were replaced with fake ones filled with bitterness and sadness. The boys felt pity for their friend. But there was nothing they could to help him. They had tried talking to him. They had tried reasoning with him, but he wouldn’t listen. He didn’t want to follow their advices. He obviously wanted to deal with his problem in his own way. The boys sighed . . . . they knew their friend was being totally foolish and unreasonable. . . . but they couldn’t stop him. He had already made up his mind. After half an hour . . . . the record companies finally reached a decision. They were all called into the office to discuss everything. Moniqa, Se7en and the DBSK boys, together with their respective managers all nervously went in. “Let me get straight to the point . . . . ” the president of the Sony Music Entertainment said. “I know you are all worried and anxious about what will happen . . . now that Se7en and Moniqa had been exposed in the magazines and newspapers as lovers. We have finally reached a suitable solution for this problem. I hope of all of you will agree and abide by what we have decided,” the older man said. “Can I just say something . . . please?” Se7en suddenly asked the three officials of the record companies. “Yes . . . what is it that you want to talk about?” the president of Avex Trax asked. “Well . . . . sir . . . I would just like to say . . . that I am solely responsible for all this mess . . . . Can you please spare Moniqa?” Se7en asked with concern in his eyes. “We have decided that your concert with Moniqa will go on as scheduled. And the DBSK boys will still perform in your concert. As for the scandal, regarding you and her . . . . we have decided that after your concert . . . your relationship with each other will be formally announced,” the president of YG Entertainment said. Se7en looked at Moniqa with a worried expression on his face. “Formally announced?” Se7en asked again. “Yes . . . . your managers have told us that the two of you have been close for the past years and it is only recently that the two of you have developed feelings for each other,” the president of SM Entertainment said. “So we have decided to end the fake relationship of Xiah and Moniqa. We will be making a formal statement to the press regarding their sudden break-up . . . today . . . . . Then after the concert . . . . Se7en . . . . Moniqa . . . . both of you are already free to go on with your relationship without any worries,” the president of YG Entertainment said again with a big smile on his face. “Don’t worry . . . . Se7en . . . . Moniqa . . . . we don’t oppose your relationship . . . In fact, we support it. We think that both of you perfectly fit each other. . . .” the president of Sony Music said with a smile. Xiah suddenly felt very jealous that both the presidents of YG Entertainment and Sony Music Entertainment were supporting Se7en and Moniqa. It was breaking his heart just thinking of them together. “So Xiah and Moniqa’s charade is really over?” Se7en asked again. “Yes . . . .it is over. . . ” the president of SM Entertainment answered. After hearing that it was really over between him and Moniqa, Xiah finally glanced at her. Moniqa also looked at Xiah’s direction. After a very long time, the two finally looked into each other’s eyes. Xiah could see the sadness and pain in her eyes. It was as if his heart had already stopped beating. He didn’t want to look at her anymore. It was too painful. He wanted to return to the time that he and Iqa were just starting their love for each other. How he wished that it was still the same. “Xiah . . . .” Iqa had unconsciously uttered. Se7en saw the way that Xiah and Moniqa were looking at each other. He could feel jealousy creeping up in his heart . . . but he just tried to brush it aside. He knew he had no right to be jealous. He was the one in the middle . . . . and he was the one who was breaking up Xiah and Moniqa. “So that is all what we wanted to say. . . . We all hope that you will try to avoid making anymore scandals . . . . like this . . . .” the president of Avex Trax said seriously. “Xiah . . . . Moniqa . . . . we will be releasing the statement of your formal break-up in an interview an hour from now . . . . Don’t worry . . . .the two of you don’t have to attend. We will be handling this affair by ourselves,” the president of Sony Music Entertainment uttered. “Well . . . . you can all go now . . . . ” the president of Avex Trax said. The DBSK boys looked at Xiah. He was silently staring at Moniqa. Moniqa and Se7en with their managers had all stood up and were about to leave, when Moniqa suddenly approached Xiah. “Goodbye . . . . Xiah. . . . . I will never forget you . . . . . I hope you will be happy . . . . .And thank you for the memories . . . . ” she said as she sadly looked straight into his eyes. Xiah felt like time had suddenly stopped. As he heard her say goodbye . . . . his heart had suddenly stopped beating as well . . . . . and at that exact moment . . . . he felt like he had already died. Moniqa was silently sitting on the sofa while drinking a glass of wine. She had been staring blankly at the TV screen for almost an hour. Her break up with Xiah had already been announced by Sony Music a few days ago. Many reporters covered the sudden press conference and it was even aired live in a showbiz program. She wanted to think . . . . but there was nothing on her mind . . . . except the fact that Xiah and her were finally over. She suddenly laughed bitterly as tears rolled down from her eyes. She was missing Xiah badly, and it was driving her mad. She wanted to forget . . . . forget everything . . . .
She had been dreaming of him these passed few days. She didn’t want to think about him anymore, but he just kept on appearing in her head. She slowly twirled the glass of wine in her hand. It was already empty. She suddenly tossed the glass of wine on the floor. And within seconds . . . . the glass had shattered into tiny pieces. Then she saw the two bottles of wine next to her . . . she quickly grabbed them, one by one and tossed them on the floor as well. She was missing Xiah so much . . . . she had tried every possible way to forget him. But she just kept on thinking about him. He was like air she couldn’t live without. She couldn’t control her mind . . . . and especially not her heart. She was already crazy with her longing for him. She had been drinking for hours and the wine had already taken effect . . . . both in her body and in her mind. She was already drunk and she wasn’t thinking straight. She was already feeling very dizzy. Slowly she tried to stand from the sofa that she was sitting on. And as soon as she stood up, she immediately fell down again on the sofa. She already felt that everything around her was spinning. She tried to get up again. She was able to walk a few steps away from the sofa when she felt dizzy again. Moniqa tried to control herself. She tried to fight the dizziness she was feeling. But her body was already weak. . . . and within minutes, she fell on the floor with pieces of broken glass scattered everywhere. As Moniqa helplessly fell on the floor . . . . she somehow could feel the tiny pieces of glass that pierced different parts of her body. She knew it should hurt and that she should feel great pain. But she was somehow numb all over. She couldn’t feel anything. And as she finally lay motionless on the floor . . . . she suddenly noticed the bright red liquid oozing on the floor where she lay. . . . . It was blood . . . . her blood . . . . She was bleeding profusely. Moniqa just closed her eyes. She didn’t care if she died at that moment. She didn’t care about anything . . . . anymore. She was thinking that she was going to die anyway. . . .so she didn’t need to prolonged it. Before she had a reason to keep on fighting and hoping . . . . but now that Xiah was gone . . . . . She didn’t have any reason to live anymore. The DBSK boys were all sitting in their van. Their scheduled rehearsal for Moniqa and Se7en’s concert had been cancelled in order to give way to a sudden video shoot. “What’s with this sudden video shoot?” Max asked while they were in the van. “Don’t know . . . . They just said that it is going to be used for the commercial for the concert,” Micky replied. “Oh . . . .” Max uttered. “Why all of a sudden?” Micky asked again. The other DBSK boys just shrugged their shoulders. “So . . . . hyung . . . .where are we going now?” Jaejoong asked their manager. “Well . . . . we are all to meet up in front of Moniqa’s apartment. Se7en and his manager are already on their way. And the bus with the staff members are almost there as well. All of us are going to pick Moniqa up in her apartment since she doesn’t know about the sudden change of plans,” the DBSK boys’ manager answered. “Why do we have to pick her up?” Xiah asked unexpectedly. He was obviously irritated. The other DBSK boys glanced at Xiah. They knew that he didn’t want to see Moniqa. And it was the main reason why he was being irritable. After several minutes, they finally arrived at Moniqa’s apartment. But they were the first to arrive at the place. “Well . . . . we’re here,” the DBSK boys’ manager announced. “Why aren’t the others here yet?” he asked as he looked around. “Don’t worry . . . . they will be here. Maybe they just caught up with something,” Jaejoong said to their manager. “Yes . . . . you’re right,” their manager replied. A few minutes later . . . . Se7en together with his manager finally arrived in their van, followed by the bus with the crew members. Se7en and his manager hurriedly got out of their van with worried looks on their faces. They approached the DBSK boys and their manager who have also gotten out of their van as well. “What’s wrong?” the DBSK boys’ manager asked Se7en’s manager. “We have been trying to contact Moniqa . . . . but she hasn’t picked up her phone. Her manager has been trying to call her both on her cell phone and the phone at her apartment . . . . but she also hasn’t answered him,” Se7en’s manager answered. The DBSK boys suddenly became worried. “Are you sure that she’s home? Maybe she is with a friend . . . . or maybe she left her cell phone somewhere . . . . that’s why she’s not picking up,” Max asked Se7en and his manager. “Moniqa never leaves anywhere without her cell phone. And she is supposed to be home . . . . I drove her home last night. I am really worried about her,” Se7en answered. Xiah suddenly felt a sharp pain in his heart as he heard Se7en say that he had brought Moniqa home the night before. Moniqa’s acting manager suddenly arrived. He hurriedly got out of his car and he ran to where the Se7en and the others were. “What’s wrong?” Se7en asked worriedly. “Hurry . . . I’ve checked with the apartment’s management . . . . and they’ve confirmed that after she arrived home last night . . . . she never went out again. I’ve already asked them to help us open her door,” Moniqa’s manager said with concern written all over his face. As soon as Se7en heard what Moniqa’s manager said . . . . he hurriedly ran into the apartment building. Moniqa’s manager and Se7en’s manager ran after Se7en. They were all very worried. “Let’s go . . . .” U-Know said to the other DBSK boys and their manager. “They can handle it all . . . on their own,” Xiah suddenly said. “Hyung . . . .” Max uttered. “If you don’t want to go . . . . You can just stay here . . . . but we’re going in,” Jaejoong said in an irritated voice. Xiah looked at Jaejoong. He seldom see Jaejoong irritated or upset . . . . so he was quite surprised with Jaejoong’s reaction. Jaejoong together with the other DBSK members and their manager entered the apartment building. Xiah couldn’t do anything but helplessly follow them. They arrived at Moniqa’s apartment . . . . Se7en and the two managers were still waiting for the apartment personnel to open the door. “Come on . . . . what’s taking you guys so long?” Se7en asked impatiently. “Sorry . . . . sir . . . but it isn’t easy to open Ms. Moniqa’s apartment door. It has a different security lock installed and it can only be activated from the inside,” one of the men answered. “Do something . . . . You’ve got to hurry . . . . She might be dead by now . . . .” Se7en angrily shouted at the apartment personnel. He was already very nervous. He was very worried about what might have happened to Moniqa. Fear was already written all over his face. The DBSK boys were all shocked with what they heard. They suddenly became very concerned for Moniqa as well. Xiah . . . . who was trying very hard to control his emotion just acted like he didn’t care about what was going on. But deep inside . . . . his heart was already screaming Moniqa’s name. He was also very worried about what may have happened to her. The men who were trying to open Moniqa’s room suddenly became alarmed as well. “If it is okay with you . . . . We can open the door but we will be destroying the whole security system for this door . . . .” one of the men said to Se7en. “I don’t care if you guys have to destroy the whole door and building . . . .Just get that door open . . . . now!” Se7en said angrily. The men hurriedly worked on the door. After ten minutes, the men were finally able to open the door. As soon as the door was opened . . . . Se7en immediately stormed into Moniqa’s apartment. The DBSK boys and the three managers also followed him straight into the room. Never in their wildest dreams did they expect the kind of horror that they would find once they entered the room. Se7en was the first one to go inside the room. But as he entered the living room . . . . . his heart immediately stopped the moment he saw Moniqa lying lifeless in a pool of blood. “Iqa!” Se7en screamed. He immediately went to Moniqa’s side. Then he searched for her pulse. “She’s still alive,” he uttered. “Hurry call an ambulance . . . .” the DBSK boys’ manager said to one of the apartment personnel. “Iqa . . . . Come on baby . . . .Open your eyes . . . . Don’t scare me like this.,” Se7en said with a trembling voice as he tried to touch Moniqa’s bloody face. The DBSK boys and the managers were all stunned with the sight that they saw. Xiah just stood looking blankly at Moniqa on the floor. It was as if he was in a dream . . . a nightmare that he wanted to wake up from. Se7en started to move Moniqa carefully. But he was having trouble because of the many broken glass pieces scattered all over the room. U-Know and Jaejoong hurriedly helped Se7en to move Moniqa. There were so many cuts in her body that Se7en was instantly covered with blood the moment he carried her in his arms. Everyone who saw Moniqa’s condition was suddenly terrified. She was lying face down on the floor. But as soon as she was turned, they all saw a very large piece of broken glass stabbed on her chest. Everyone was suddenly horrified. The wound was open and was bleeding profusely. Moniqa was already pale and her lips were almost gray. “Moniqa . . . .” Jaejoong said with concern in his eyes. “Get her to the van!” Moniqa’s manager exclaimed. “Hurry . . . . she’s already lost a lot of blood,” Se7en’s manager said. “Iqa!” Xiah suddenly uttered. He suddenly snapped out of his madness and his heart started to beat very fast. He wanted to go to her side and make her open her eyes. He couldn’t believe the sight that he was seeing. Moniqa was lifeless in Se7en’s arms. He wanted to scream . . . . he wanted to tell himself that it was all a dream . . . . a very bad dream. As Se7en hurriedly carried her down into the waiting van, the DBSK boys and the managers were all praying very hard that she will be all right. “Moniqa . . . . please don’t give up. . . . Hang on . . . . please . . . .I know . . . Xiah is the only man you love . . . . . Don’t worry . . . . I will help you to get him back . . . . I will do whatever it takes to make him come back to you . . . .Just promise me you won’t give up. . . .I love you, Iqa. . . . But I am willing to let you go . . . . .as long as I know you’re happy . . . . and very much alive. . . . Please Moniqa . . . .Please . . . .Fight . . . . Hang on . . . . We’re almost there . . . . We’re almost at the hospital . . . . Hang on. . . . Please don’t die . . . .,” Se7en repeatedly said as he held Moniqa in his arms. Tears were already streaming from his eyes. How he wanted to help Moniqa . . . . he never imagined he would ever see her in such a horrible condition. The DBSK boys and their manager followed Se7en’s van to the hospital. While on their way . . . . Xiah was also praying very hard for Moniqa’s safety. “God! Please . . . . help Iqa . . . . I still love her . . . . I just suddenly realized that I won’t be able to live without her. . . . Please . . . . Please give her back to me . . . . . I promise if you give me another chance, I will try to fix everything . . . . . Please save her. . . . . I need her,” Xiah said in his mind as tears rolled down his cheeks. Se7en, together with the DBSK boys and their managers were all waiting patiently outside the emergency room of the hospital they had brought Moniqa in. They were all very worried and nervous. They were all praying that she would be fine. “What do you think happened to her?” Max unexpectedly asked the other DBSK boys. Jaejoong and Micky both just shook their heads. They were also wondering what really happened to her. “Did you see the broken bottles? God! I don’t even want to remember . . . . .” Max said as if very horrified. “Maybe she got drunk . . . . and she accidentally slipped . . . . while holding the bottle . . . . and . . . . .and . . . .” Micky tried to find a perfect explanation for what occurred. “The press will surely have a field day covering this news . . . . .” Moniqa’s acting manager said with a sigh. “Has the companies been informed about Moniqa’s condition?” the DBSK boys’ manager asked. “Yes . . . . I have already informed everyone. . . . I just hope she will be all right. Her real manager will be here in a few hours,” Moniqa’s manager said again. “Some reporters are already waiting downstairs. . . . so I suggest you all be careful in going out of the hospital,” Se7en’s manager suddenly said to Se7en, the DBSK boys and the two other managers. He had just finished talking on his cell phone. And their driver had already informed him that news vans and reporters were already stationed outside the hospital. “How did they find out?” Max asked suddenly. “Nothing is impossible with the press people . . . . Whenever and wherever there is a big news . . . . they will surely find it,” the DBSK boys’ manager answered. “What do we do now?” Micky asked the other managers. “We don’t have to worry about the press . . . .What is more important now is Moniqa . . . . ” Se7en suddenly uttered. The DBSK boys all looked at Se7en. He was still wearing his bloody clothes. He was obviously very tired as well. “He’s right . . . . For now . . . .let’s just wait. . . . .” Se7en’s manager told the others. Another hour passed . . . . .
A doctor finally came out of the emergency room. Se7en immediately approached the doctor and with a trembling voiced asked about Moniqa. The doctor looked at Se7en. He didn’t know how to start what he wanted to say. “First of all . . . . we have already removed the big piece of glass on her chest and treated her other minor injuries. . . . But . . . . our main concern now is . . . . the condition of her heart . . . . Her heart is already very weak . . . . We have already communicated with her attending physician and the hospitals she is connected with. They have already provided us with her medical records. . . . And frankly, we are all amazed that she has survived this long without a heart transplant . . . . . But sad to say . . . . her condition has worsened. She needs a heart transplant as soon as possible . . . . But as of now . . . we are still unable to get a suitable heart donor for her . . . .” the doctor explained. Se7en was totally stunned by what the doctor said. “So you mean . . . . she might die?” Se7en asked with a trembling voice. “I’m sorry to say that we are only giving her until tomorrow . . . . If by that time . . . . she still doesn’t receive a new heart . . . . Then I’m sorry to say . . . .she may not survive,” the doctor replied. It was like a bomb had suddenly been dropped in front of Se7en, the DBSK boys and their managers. . . . what they suddenly discovered was too much of a shock for them. All of them were totally speechless and unable to move. “Doctor . . . . please . . . . you’ve got to do something . . . . Please help her,” Se7en said as he begged the doctor. Se7en felt like his whole world was spinning. He suddenly leaned against the wall and started to cry. He didn’t want her to die. He loved Iqa so much. . . . he was willing to do anything for her. The doctor just gently tapped Se7en’s shoulder as he slowly moved away. Xiah who was just sitting quietly in a corner was already in the brink of totally losing his self-control. He was trying to pretend that he didn’t care and that he wasn’t affected by what was happening wound him. Max just looked at Xiah with a weird expression on his face. He couldn’t imagine how Xiah was able to act like he didn’t care at all. He wanted to get angry with him because Moniqa was already dying and he was still thinking about himself and his pride. “Hyung . . . Iqa . . . . is already dying and you’re still angry with her?” Max asked surprisingly. “What?” Xiah suddenly asked as if caught by surprise by what Max had asked. “Xiah . . . . Please just forget about your anger and the hurt . . . . she’s dying . . . .” Micky said while looking at Xiah with a sad look on his face. “We know we don’t have any right to say this to you . . . . but we know that you still love her . . . . and we can certainly see that she still loves you . . . . And frankly . . . . we all think that the main reason why she did this is . . . . because of . . . . you . . . ” U-Know said with serious expression on his face. Xiah stared at his friends. He knew that they were right. And he was already willing to forget everything . . . . The only problem was that he didn’t know how to react since Se7en was around. Se7en heard everything that the other DBSK members said to Xiah. He tried to control his tears and suddenly tried to sum up all his courage to finally tell the truth to Xiah. Se7en slowly approached Xiah. He was determined to finally clear everything up regarding Iqa and him. “I think it is about time that we talk . . . . man to man . . . .” Se7en said to Xiah with a serious expression on his face. Xiah just stared at Se7en and nodded. He quietly followed him into a secluded part of the hospital. As soon as they were alone . . . . Se7en angrily approached Xiah and gave him a straight punch in the face. Xiah was totally taken by surprise that he didn’t have time to avoid Se7en’s fist. Xiah suddenly fell down on the floor. Se7en’s punch was very strong that his lower lip had immediately started bleeding. “Why?” Xiah asked with a surprised look in his eyes. “That is for Moniqa . . . . . You didn’t even give her the chance to explain herself to you . . . . Do you know how hurt she was? She tried to talk to you, but you just ignored her. I know I was partly to blame as well. But . . . . what you saw that day . . . . wasn’t what you were thinking . . . . She never cheated you . . . . She loved you . . . . And from the very start . . . . she was honest with me about it . . . . And the only reason why you saw me kissing her . . . .was because . . . . because I wanted her to know about my own feelings for her. . . . But she told me that the only man she loves is you . . . . ” Se7en said as he tried to control his emotions. “I . . . . I . . . .” Xiah tried to say something but he couldn’t think of anything to say. “She loves you . . . . Xiah. . . . You were the only reason why she was trying to fight for her life. . . . You are the only one she is living for . . . . So I guess after you got mad with her . . . . she became very depressed. And that’s why she was drinking . . . . and she . . . . she . . . .” Se7en said in a low voice. “I . . . . I . . . . I still love her too,” Xiah finally uttered. “You should have given her the chance to explain . . . . You didn’t have to be so cruel to her . . . . and avoid her. . . ” Se7en said. “I know . . . . and I’m sorry,” Xiah uttered. “While we were on our way here to the hospital . . . . I told her that I would help her to get you back. . . . . if she would only fight to live . . . I know that it is what she wanted most in the world. . . . You are the only man she wants . . . . and loves. . . . So please go back to her . . . . Make her want to live again . . . . ” Se7en said with sad eyes. Xiah was totally speechless. He didn’t know how to respond to Se7en. “And the punch was also for me . . . . frankly . . . . I am angry with you. I love Iqa . . . . but since you are the one that she loves . . . . I am willing to let her go and be with you . . . . So please . . . . this time . . . . try to make everything right . . . . She doesn’t have much time left . . . . Make her happy . . . . .” Se7en said as tears finally fell from his eyes. “Thank you . . . .” Xiah uttered. Xiah nodded and tried to smile. “Go . . . . she’s waiting for you . . . . Please make her happy for me,” Se7en said as he turn his back on Xiah. Xiah just quietly left Se7en alone . . . . .
“Iqa . . . . I love you . . . . I hope you will be happy now . . . . I told you I will get him back for you . . . . Just promise . . . . you’ll try to fight . . . .and hold on. . . . I love you . . . .Iqa . . . .I love you,” Se7en said as tears streamed down his face. . . . and he finally cried uncontrollably. Xiah slowly walked to where the DBSK boys and the managers were all waiting. “Hyung . . . . Iqa has just been moved to her room . . . .” Max said to Xiah. “Where is Se7en?” Se7en’s manager asked Xiah. “He . . . . . He just wants to be alone for now,” Xiah answered. Somehow all the men understood what he meant. “The doctors said that as soon as Moniqa is set in her room . . . . We can all see her then,” the DBSK boys’ manager told Xiah. Xiah nodded. He tried to think if he was even strong enough to see Iqa in her condition now. He was very much afraid that the moment he saw her. He wouldn’t be able to control himself and that he would suddenly break into tears. “Hyung . . . . are you all right?” Max asked with concern. They all could see that he wasn’t himself. He was obviously thinking about something else. “Yes. . . .” Xiah replied. After several minutes . . . . Moniqa’s acting manager arrived. Moniqa was already in her room. And the doctors have already allowed them to see her. “We can all go to her room now . . . .” Moniqa’s manager announced. All of them were very nervous as to what they would see. Se7en had already joined them as soon as he found out that Moniqa had been moved to her room. “I don’t think I want to see Moniqa . . . . in such a pitiful condition,” Micky said to Jaejoong. “Yes . . . . me too. I don’t think I can take it if I see her in a hospital bed and still unconscious. It is too saddening . . . .” Jaejoong replied. Xiah could hear everything that his friends were saying. And somehow everything that they had said had also been on his mind. He was also asking himself . . . if he can stand seeing Iqa lying in a hospital bed . . . . pale as a ghost . . . .unconscious . . . . dying . . . . Just thinking about it was already breaking his heart. Xiah tried to close his eyes . . . .
“Please . . . . let this just be a dream . . . . a bad dream . . . . Let me wake up please,” he begged in his mind. “Xiah . . . .” U-Know suddenly tapped Xiah’s shoulder. “Are you all right?” he asked. Xiah looked at U-Know. “I . . . . I am afraid . . . . I will break down once I see her,” he honestly answered. U-Know suddenly smiled. He was happy that his friend had finally admitted his true feelings. “Just be strong . . . . You need to be strong . . . . for her sake . . . .” he said to Xiah. Xiah tried to smile even if his heart was slowly aching. They quietly entered Moniqa’s room with all of their hearts pounding heavily. They were all afraid of what they were about to see. As soon as they entered her room . . . . all their fears suddenly became a reality. Xiah immediately cupped his face in total disbelief. He didn’t want to accept what he was seeing was real. He wanted to just turn back and pretend that he didn’t see Moniqa in such a pitiful situation. All the men’s hearts were instantly broken after they had finally seen Moniqa. She was lying in the hospital bed with different machines attached to her body. She had several bandages on her arms and some cuts on her beautiful face. She seemed so lifeless . . . . that Xiah’s tears immediately fell the moment he saw her. The other DBSK members saw Xiah’s reaction and tried to comfort him. They knew that he was hurting because of Moniqa. “Hyung . . . . Try to be strong . . . .,” Max said with concern. Xiah glanced at Moniqa’s direction again. His heart was already heavy with pain and sadness. He couldn’t accept that the girl he loves was going to die. . . . He couldn’t accept he was going to totally lose her. He tried to walk closer and closer to her . . . . one step at a time. He felt that his feet was somehow too heavy to move. And he was afraid . . . . he wasn’t sure what he might do once he was already close to her. “Xiah . . . . she’s been waiting for you . . . .Don’t waste the remaining time left” Se7en said with a sad voice. Xiah looked at Se7en and then at Iqa. Se7en was right . . . . he had to take advantage of the time he had left with her . . . .
Xiah slowly moved forward . . . Then as he was finally in front of Moniqa, he gently took her hand and held it between his two hands. “Iqa . . . . I’m here . . . . Please open your eyes . . . .” Xiah uttered with a trembling voice. He was sure that any moment his tears will come again. The DBSK boys, Se7en and the three managers silently left the room. They knew that Xiah needed some time alone with Iqa. They wanted him to be able to spend the remaining time alone with her. Xiah sat down beside Moniqa’s bed as he was still holding her hand. He didn’t want to let it go . . . . he was scared that the moment he let go . . . . she would slip away from him permanently. He wanted her to feel the warmth of his hand . . . . and the love he felt for her. “Iqa . . . . I . . . .I’m sorry . . . . Can you forgive this foolish man in front of you today? I know I have been very foolish . . . . and I have hurt you badly . . . . I didn’t even give you the chance to explain yourself to me . . . . I was very jealous with you and Se7en that I let my mind and heart get all confused . . . . and I admit I was totally unreasonable. I wasn’t thinking straight. . . . . and I didn’t even consider your feelings. I was totally selfish . . . . . There were a lot of times that I wanted to talk with you . . . . but I let my foolish pride get in the way. Please . . . . Please open your eyes . . . . don’t worry I will do whatever it takes to help you . . . . I won’t let you die . . . . I don’t want you die . . . . You can’t leave me . . . . Do you hear me? Don’t leave me . . . . I don’t think I can live without you . . . .” Xiah said as he held her hand. Then he gently kissed her hand. “I’m sorry . . . . Please wake up . . . . Don’t leave me . . . . I don’t know what I would do without you . . . . I just realized how much you really mean to me . . . . If I can only turn back the time . . . . I would try to fix all the wrong things that I have done. . . . ” Xiah said as tears started to fall down one by one. “Why didn’t you tell me about your condition? Why didn’t you tell me you were sick? Why? Now I am left with nothing to do but watch you as you slowly slip away from me . . . . Do you know how painful it is for me to see you this way? If I can only take all the pain and your sickness away and just take it all on my own . . . . I would do it . . . . that is how much I love you . . . . I am willing to do anything for you . . . .Iqa . . . . I love you . . . . I love you . . . .” Xiah said as he finally started to sob. “Xiah . . . . .” Moniqa softly uttered. Xiah suddenly looked at Moniqa. She was already awake, but obviously very weak. She tried to smile. But somehow her smile just brought pain to Xiah. He could feel that behind her smile was a pain that he couldn’t even imagine. “You’re finally awake . . . . How are you? Do you feel any pain?” he worriedly asked. “Why . . . . Why are you here?” she asked softly. “I . . . . I . . . .” Xiah tried to find the right words to say. Xiah suddenly held Iqa’s hand tighter. “I . . . .I’m sorry . . . .Iqa. Can you ever forgive me?” he asked as he looked straight into her eyes. “Xiah . . . .” she softly uttered. She was already feeling very weak. She already knew that she didn’t have much time left. She could feel it . . . . and the reality was adding more pain to her heart. “Iqa . . . . Can we go back to the way we were before?” Xiah suddenly asked while still holding her hand. “I still love you . . . . Please can you give me another chance? . . . . Please . . . .” Xiah begged. Moniqa stared into Xiah’s eyes. She could see the love and pain in his eyes. Right then she knew that he already knew that she was dying. Slowly the tears started to form in her eyes . . . .
“Why?. . . .Why are you crying?” Xiah asked with concern in his eyes. Moniqa shook her head. “Don’t you think it is already too late for us? Even if we fix everything now . . . . the fact still remains . . . . . I am dying . . . . I can see it in your eyes. You already know. . . . Is that the reason why you are here now? You learned that I was dying and you are pitying me?” she asked with tears falling from her eyes one by one. “No . . . . I love you . . . . And I’m not here because I pity you . . . . Yes, I already know about your condition . . . . But it doesn’t have any connection with my decision to come back to you . . . . I have been wanting to do it . . . . I was just lacking the courage and I was being too selfish . . . . Please. . . . believe me . . . .” Xiah said as he stared at Moniqa. Moniqa smiled bitterly. “But it is already too late . . . . Xiah. Even if we continue with our relationship . . . . our love will just be going nowhere . . . . I have been on the waiting lists of a dozen hospitals all over Asia for years now. But until now . . . .I haven’t even found one donor . . . . There are always problems . . . .complications. . . . So you see . . . until now . . . . I’m still dying. And frankly, I already have learned to accept it. . . .” She smiled again. She was trying to hide the pain that she was feeling. “No . . . .Iqa . . . . Please don’t say that . . . .” he said as tears were flowing his eyes. Moniqa brushed the tears from Xiah’s eyes with her hand. “Crying doesn’t suit you. You’re way too cute for crying . . . .” she said as she tried to laugh. She wanted to stop Xiah from crying. It was making her feel so much pain seeing him cry. “It’s useless . . . .Xiah . . . .” she finally uttered. “No . . . . it’s not the end yet. . . . . We can still find a way . . . .Please don’t lose hope . . . . ” Xiah said with a trembling voice. “Xiah . . . .” she said as she was trying to keep herself from crying uncontrollably. Moniqa closed her eyes. “God. . . . Please give me more time to say goodbye to him . . . . .” she said in her mind. Slowly her tears fell down again. Unexpectedly. . . . Xiah kissed Moniqa’s forehead. She surprisedly opened her eyes. And she was finally looking straight into his eyes . . . . up close . . . . It had been such a long time . . . . since she had been this close to him. She could feel her heart was beating wildly. How she wanted to be with him again. . . . . How she wanted to love him again . . . . How she wanted to be able to grow old with him . . . . But she knew it was all a dream . . . . A dream that could never come true . . . .
“Xiah . . . . I . . . . I’m dying . . . . It’s too unfair for you . . . . if we just continue with out relationship . . . . when we already both know where it is going to end . . . .” she said with a sad tone. Suddenly Xiah softly kissed Iqa’s lips. He was very gentle . . . . He wanted to remember this moment as long as he lived . . . . He wanted to store this special memory in his heart and his mind forever. Moniqa allowed Xiah to kiss her. She wanted to give him a special remembrance of their time together. She lovingly kissed him back. She brushed aside all her inhibitions. . . and just acted according to what her heart was dictating. As they were kissing each other. . . . Moniqa suddenly felt a very sharp pain in her heart. The pain was too much that she immediately cried out in pain. Xiah was immediately alarmed. “I . . . . It hurts . . . . Xiah . . . . .” Iqa cried in pain. Xiah suddenly rushed out the room to call the doctors. Within minutes . . . . doctors and nurses were already rushing in and out of Moniqa’s room. Xiah and the others just waited patiently outside. Xiah didn’t know what to do. He could hear that Iqa was crying and was in so much pain. As he heard her moan in pain . . . . he could feel his heart was being ripped out of his body. It was as if he was the one dying. He couldn’t stand hearing her anguish. A doctor suddenly came out . . . .
“I’m sorry . . . but the patient needs to have an operation in the next six hours or she won’t be able to survive . . . .” the doctor suddenly announced. “Has a donor been found?” Se7en asked. The doctor suddenly shook his head. “I’m sorry . . . but finding a donor these days is very difficult. And frankly . . . . even this is already an emergency case . . . . We still can’t find a donor for her . . . .” the doctor replied. Xiah heard what the doctor had said and somehow he suddenly felt very weak. He was totally confused. Everything he had discovered during that day was already bringing him to the brink of insanity. “Can’t you help her? Please . . . . Can’t you try to help her?” Xiah continuously asked the doctor. “Sorry . . . . But finding a donor at such a short span of time is nearly impossible,” the doctor replied again. “Maybe we can help find a donor . . . .” Moniqa’s manager suddenly said. “Finding a donor is not that easy. First of all . . . . the donor’s heart must be healthy. And second is . . . . unless the donor himself writes a written consent that he or she allows Moniqa to be the sole recipient of his or her heart . . . . then it is the only way that we can use his or her heart without any delay,” the doctor answered. “Are there any important things we should know while trying to find a donor . . . I mean what blood type he must be or are there age requirements?” Moniqa’s manager asked again. “Any kind of heart donor will do . . . . either male or female . . . . and blood type is no longer important now . . . .” the doctor replied again. “I see . . . . I will try to contact our company right away . . . . I will see what I can do,” Moniqa’s manager said. Xiah just quietly listened. He was thinking of a way to help Iqa. He wanted to help her in anyway that he can. Then suddenly Moniqa suddenly screamed . . . . Xiah rushed into the room. And there he found her already clutching her chest . . . . She was obviously in so much pain. It was making Xiah mad as he watched her in so much agony. The sight was pure torture for him. Tears started to roll down his cheeks. “Iqa . . . .” he uttered. Unexpectedly . . . . Moniqa passed out. The nurses and doctors asked Xiah and the others to step out of the room. Then after a few minutes . . . . she was already being transferred into the ICU area. “She’s in critical condition now . . . . So we are moving her to the ICU. . . . ” a doctor suddenly announced to Xiah and the others. As Xiah watched Moniqa being moved into the ICU room . . . . his heart and mind was totally spinning. He wanted to help . . . . He needed to help her . . . . He must help her . . . . . He can’t possibly live without her . . . . He would rather die than live without her. Suddenly . . . . . a thought came into Xiah’s mind . . . . He knew it wasn’t right . . . . But he knew it was the only way that he could help Iqa. He immediately walked up to their manager . . . .
“Hyung . . . . Can I borrow the van? I need to go somewhere . . . .It is very important . . . .” Xiah said seriously. The DBSK boys’ manager could feel that there was something strange about Xiah as he looked at him. “Okay . . . .You can take the driver with you,” he replied. “No . . . .I need to go somewhere . . . . alone,” Xiah said. “Very well. . . . Just be careful,” their manager said with concern. Xiah looked at his friends . . . . . “Take good care of her while I am gone . . . .” he said to them. The other DBSK boys just nodded. Xiah then hurriedly left the hospital. A few minutes after he left . . . . Se7en’s cell phone suddenly rang. Se7en answered the call . . . . . And he was surprised . . . . It was Xiah who was calling him. Xiah had already shut off his phone before Se7en could say anything. Xiah was driving the van in an alley. He wanted to do it as fast as he could and without anyone getting hurt . . . . except him. He was already determined . . . . . He looked at the piece of paper in his hand. Then he suddenly smiled. It was a consent paper stating that he was willingly donating his heart to Moniqa. “I love you . . . .Iqa . . . . I am sorry . . . . I can no longer be with you . . . .Please try to live a happy life. And always remember . . . I will always be with you,” Xiah uttered as he stepped on the accelerator of the van. Then as the speed of the van increased . . . . he just closed his eyes. . . . .
Back in the hospital . . . .
Moniqa was already in the ICU . . . . when her heart suddenly stopped . . . . .
Moniqa opened her eyes . . . . The light was too bright . . .She didn’t know where she was . . . . She knew she was standing but she also felt like she was floating. . . . . She was very confused. . . . .She closed her eyes again. . . . Then she heard a familiar voice . . . .It was as if someone was calling her . . . . She opened her eyes again . . . . This time she saw a familiar face . . . . It was Xiah . . . . He was standing in front of her with a bright smile on his lips. He was being surrounded by a a very bright light . . . . Somehow it was the light that was blinding her eyes. “Xiah . . . .” she uttered. Xiah was holding his hand out to her. She quickly took hold of his hand. And then he started to lead her into a path where a bright light was also emanating. . . . They were almost at the middle of the path when he suddenly stopped . . . .
“Xiah . . . . where are we?” Moniqa suddenly asked. She was already very confused. She couldn’t understand it. But she could feel that there was something very different with him. Xiah slowly looked at Iqa with a sweet smile on his lips . . . . but there was also sadness in his eyes. “Iqa . . . . . I’m so happy to see you again . . . . even for the last time,” he said. “Xiah . . . . I’m very confused already . . . . Can you please answer me . . . . Where are we?” she asked while looking at Xiah’s sad face. “We’re between heaven and earth . . . . I brought you here . . . .because I just wanted to be able to spend some time with you . . . . before you go back . . . .” he said as he tried to hold back his tears. “Go back? . . . . . Between heaven and earth? . . . . Xiah . . . . Please you’re scaring me . . . . Stop it . . . . please,” Iqa said with a quivering voice. Moniqa saw the sadness in Xiah’s eyes. “What have you done . . . . Xiah?” she suddenly asked nervously. “What do you mean?” she asked again. She was already very confused. “I love you Iqa. . . . So I gave up my own life . . . . just to save you . . . .” he answered. Moniqa was shocked with what Xiah had said. “What? What are you saying? Give up your own life . . . . just to save me? What do you mean? Xiah . . . . What are you trying to say?” Moniqa asked with a raised voice. She was already very emotional. She didn’t like the way Xiah was talking. And she didn’t like what he was trying to say. “I’m sorry . . . . Iqa . . . .” Xiah uttered as tears slowly flowed from his eyes. . . . one by one . . . .
Moniqa’s heart somehow stopped the moment she finally realized what he was trying to say. “No . . . . no . . . . . no . . . . .” Iqa shouted. She suddenly felt very weak. “What have you done . . . . Xiah? Why?” she asked again as she finally broke down into tears. She was very weak that she suddenly fell down on her knees. “Why? Why?” she asked again and again as she continuously cried. Xiah gently embraced Moniqa. He didn’t want to see her in so much pain. “Iqa . . . . please stop crying . . . .” he begged as tears also flowed from his eyes. “You’re dead? Is that it? What did you do? What did you do Xiah? . . . . Why did you do it? You’re not supposed to die . . . . . I’m the one who’s dying . . . . not you . . . .” she said as she stared at Xiah. “No . . . . Iqa . . . . You have to continue with your life . . . . You have to . . . . not only for yourself . . . . but also for me . . . . I want you to be happy . . . .So you have to continue living . . . .” he said as he tried to control his emotions. “You want me to be happy?” Moniqa angrily shouted. “I can never be happy . . . . without you . . . . Xiah . . . .” she said as tears continuously flowed out of her eyes. She was already sobbing uncontrollably. Xiah didn’t know what to do or what to say to ease Moniqa’s pain. They were both in pain. . . . and somehow he wanted to undo what he had done . . . . He didn’t want to leave Moniqa alone . . . . He loved her too much. “I’m sorry . . . . ” he said as he held Iqa tighter. Tears were already streaming down his face. Moniqa continuously cried as she was in Xiah’s arms. She couldn’t bear to be away from him. She couldn’t even bear the thought of not being able to see him . . . . hold him . . . . kiss him . . . .
“Iqa . . . . promise me . . . . you’ll try to be happy . . . .” Xiah said again. “No! I won’t be happy . . . . I will never be happy . . . . I will follow you wherever you go Xiah . . . . So even if I survive . . . . . I will just kill myself . . . . so I can be with you . . . .” Moniqa said with a hard tone in her voice. She was angry . . . . angry at Xiah . . . . angry at herself . . . . angry at everything around her. “Moniqa . . . .” Xiah uttered. “I can’t live without you . . . . Can’t you understand me? I don’t know if I can last a day without you . . . .” she said as she tried to control her tears. Xiah stared at Iqa’s beautiful face as her tears continuously flowed. He didn’t want to see her cry. . . . . How he hated seeing her cry . . . .His heart was aching so badly. He wanted the pain to stop. He didn’t know if what he did was right or wrong . . . . But at that time . . . . for him . . . it was the only thing he could do for the woman he loved. And he didn’t really give much thought to what the consequences would be . . . . or about the outcome of his actions . . . . He just followed what his heart was dictating. Xiah kissed Moniqa’s head. . . . and he embraced tightened. He wanted to feel the warmth of her body . . . . It was the last time that he would be able to hold her. His tears suddenly started to fall again. “Please . . . . let this just be a dream . . . .” he silently uttered. The pain was already driving him mad. He wanted to scream . . . . He felt like someone was torturing him . . . . over and over again. And as he held Iqa in his arms . . . . somehow the torment was just too much for both of them. He was already thinking what they have done to deserve such agony . . . .
“Xiah . . . . Please just stay by my side . . . .I can’t live without you,” Iqa softly uttered. She was feeling very weak. She didn’t know why . . . . but she felt like she was ready to give up. She didn’t care about her life anymore. . . . What was more important to her was the fact that she didn’t want to be separated from him. “But you can’t stay here . . . . It is not your time yet . . . .” Xiah said with a low voice. He was already feeling very weak as well. “It isn’t your time also . . . you just made it your time . . . . Come on . . . . please say you’ll go with me . . . .” Iqa said as she gently held Xiah’s hand. Xiah suddenly felt that his heart stopped beating. He wanted to cry out and tell her that he didn’t want to leave her either. He didn’t want to be away from her. But he knew he couldn’t do anything about it. It was already too late. . . .unless God himself permitted him to return . . . . There was certainly nothing he could do to be with Iqa. Xiah closed his eyes and cried. He couldn’t control his emotions anymore. Xiah stared straight into Iqa’s eyes. He then slowly bent down his head to find Iqa’s lips. He gently . . . . lovingly . . . . kissed her . . . . It was as if all their problems suddenly disappeared the moment their lips touched Xiah wanted their kiss to last longer . . . . . he wanted to remember their last kiss forever . . . .
Moniqa’s tears fell . . . . one by one as she kissed Xiah . . . . she wanted to be in his arms forever . . . . She wanted to be able to taste his kiss . . . . and remember it for as long as she lived . . . . She didn’t want to let go of his hand . . . . She wanted to be with him forever . . . . . She was wishing very hard that everything was just a dream . . . . and that any moment she would wake up . . . . safe in his arms again. . . .
“Xiah . . . . . What’s happening?” Iqa suddenly cried out. She was starting to see through Xiah . . . . . It was as if he was disappearing into thin air. Xiah looked at his hands. He was already starting to change. “Xiah . . . .” Moniqa tried to touch him again. But her hand just passed through Xiah’s body. She suddenly gasped. “No . . . . .No . . . . Xiah . . . . don’t leave me . . . .” she said as her tears started to appear again. “I guess it’s time . . . . Iqa . . . . Please take care of yourself . . . . Remember . . . . I will always be with you . . . . and I will always love you . . . .” Xiah said as he continued to disappear bit by bit. “No . . . . No . . . . . Don’t go . . . . . No!!! !” Moniqa screamed as Xiah finally disappeared before her eyes. Moniqa suddenly opened her eyes . . . . She started to look around. She was in the hospital. She then noticed Se7en and their managers in a corner. As soon as they saw her open her eyes . . . . their eyes suddenly lit up with joy. “Iqa . . . . ” Se7en said as he hurriedly went to her side. Moniqa was still very confused. She remembered Xiah . . . .”Was it just a dream?” she suddenly asked herself. “Where . . . .Where is Xiah?” she immediately asked Se7en. Se7en looked at the other managers and then he looked at Moniqa again . . . . but this time . . . . sadness was very visible in his eyes. Moniqa’s heart suddenly stopped beating as soon as she saw the look in Se7en’s eyes. “No . . . . Where is Xiah? I want to see him? Please . . . . I want to see him . . .” she begged Se7en as her tears flowed from her eyes. “No . . . .Please . . . . let me see him . . . . I want to see him . . . . .” she begged Se7en again. Se7en just stared at Moniqa . . . . He knew she wouldn’t be able to handle what she wanted to see. But he knew she had a right to see him . . . . even if it was for the last time . . . .
Moniqa’s heart was beating wildly as she was being brought to Xiah’s room. She was on a wheel chair. And even though her doctor was against her decision to go and see Xiah . . . . It still didn’t stop her . . . . In fact, it even made her more determined to see him. “Are you sure about this Moniqa?” Se7en said to her. Moniqa looked up at Se7en. He was the one pushing the wheel chair . . . . and she could see by the expression on his face that he was very concerned about her. “I have to see him Dong-Wook . . . .” she softly uttered. “But . . . . But what if you suddenly can’t handle what you see . . . . You’re still weak. You just went a heart transplant . . . Moniqa. Your body may not be able to handle the pressure of seeing Xiah in . . . . in such a condition,” Se7en said again with concern. Se7en just accepted what Moniqa said without any further argument. He knew he wouldn’t be able to change her mind. She was determined to see him . . . . no matter what the consequences might be. As Moniqa approached Xiah’s room . . . . it was as if he could hear her own heart as it continuously pounded hard. She was somehow scared of what she was going to see. But she still wanted to know the truth . . . . even if the truth was going to be very painful. Se7en stopped in front of a room. Then he gently opened the door. . . . . and he pushed Moniqa’s wheel chair into the room. Moniqa’s heart was totally shattered the moment she laid her eyes on Xiah. He was lying unconscious on the hospital bed, with different machines attached to his body.He had bruises and cuts on his face and arms. Moniqa placed a hand over her mouth. It was like she wanted to scream. She couldn’t totally perceive what she was seeing. She kept thinking that what she was seeing was just a nightmare. “What . . . . What happened to him?” she asked Se7en with tears already forming in her eyes. “Iqa . . . . . ” Max softly uttered. Moniqa suddenly glanced at where the voice came from. Max, Jaejoong, Micky and U-Know were all sitting in a corner of the room. They all looked downcast . . . . and all their eyes were blood shot red, as if somehow they have all been crying for hours. “Iqa . . . .” Micky uttered again. “What happened to him?” she asked the other DBSK members. She was hoping that they would tell her the truth. The other DBSK boys looked at each other. They were somehow reluctant to tell her the truth. They were all aware that she was still in a very delicate condition. And they were afraid that if they told her the truth . . . .it would somehow greatly affect her health. “Please . . . . tell me the truth,” she begged the DBSK boys. The DBSK boys all looked at Se7en. They were somehow asking some help from him. They didn’t know if they should tell her the truth or not. “Moniqa . . . . Xiah . . . . was in a car accident,” Se7en said. He knew that he needed to lie . . . . for Moniqa’s sake. “Car accident?. . . . Are you telling me the truth?” she asked as she looked straight at Se7en’s eyes. Se7en’s heart suddenly skipped a beat. And then he suddenly tried to avoid Moniqa’s eyes . . . .He was afraid that she would know the truth just by looking at his eyes. Se7en and the DBSK boys were all shocked with what they heard. They couldn’t explain how Moniqa was able to know the truth. “How did you know?” Jaejoong asked suddenly. “I . . . . I had a strange dream. . . . . And in my dream, he was saying goodbye to me . . . . . And he told me about what he did . . . . ” she answered softly. She knew what she was saying was very unbelievable . . . . but she didn’t care. She knew what she had dreamt was real. . . . . Both she and Xiah had seen each other on the other side. The DBSK boys and Se7en all looked at Moniqa with a weird expression on their faces. They couldn’t believe what she had just told them. “What did the doctors say about his condition?” she suddenly asked the boys. “Almost all his injuries are superficial . . . . But the damaging injury was to his head. As of now . . . . the doctors are still unsure if he can make it through the night. They say if he doesn’t regain consciousness by tonight. . . then there is a big possibility that he may never will,” Jaejoong answered with a quivering voice. It was as if he was about to cry any minute. “Dong-Wook . . . . can you please get me closer to him . . . .” she suddenly said to Se7en. She was trying to hold back her tears. She didn’t want them to see her cry. Se7en moved Moniqa closer to Xiah’s bed. And as soon as she was near him . . . she gently held his hand and placed it near her heart. “Xiah . . . . Can you feel my new heart beating? I told you . . . . you didn’t need to do such a thing for me. What now? You did such a foolish thing . . . . And now I am going to be alone . . . .” she said as her tears finally fell. She couldn’t control her emotions anymore. “Iqa . . . .” U-Know and Jaejoong both said with concern. They knew her heart was still adapting to her body and her crying may cause some problems. “Moniqa . . . . Please don’t cry . . . . You’re still recovering from your surgery . . .” Se7en said as he was trying to remind Iqa of her condition. Moniqa looked at Se7en and the DBSK boys with tears already flowing from her eyes. “Can you please leave us alone . . . . I want to be alone with him even for a few minutes . . . . please,” she begged. “But . . . . we can’t leave you alone . . . . What if something happens to you while we are outside?” Se7en asked with concern. Se7en and the other DBSK boys gave each other glances, and just nodded. Then they quietly left the room . . . . leaving Moniqa alone with Xiah. As soon as they boys finally left . . . . Moniqa started to cry uncontrollably. “Xiah . . . . Why?. . . . What am I going to do without you? I told you I would rather be dead . . . . than live a day without you . . . . Xiah . . . . Please wake up. . . . . I’m here. . . . I need you . . . . ” Moniqa said as she cried beside Xiah. She had placed her head on the side of the bed and cried and sobbed uncontrollably. “What do I do without you? If you’re going to leave me . . . . then I will just follow you . . . . wherever you are. I don’t care about anything anymore . . . . .except the fact that I want to be with you,” she said as her tears continued to fall. “After I broke up with Akira . . . . I already made up my mind that I would never fall in love again. But then after I met you . . . . you changed everything. I fell in love with you the moment I met you, Xiah . . . . At first, I was very scared to show my true feelings for you . . . . But after awhile I realized . . . . it was already too late . . . . and I had already fallen in love and there was nothing else I could do. . . . ” she said with a weak voice. “Do you know how happy I was when I learned that you loved me too? You made me the happiest girl in the whole world . . . . I thought that we would always be together . . . . and that we would never be apart. But now . . . . . but now . . . .” she started to cry uncontrollably again. As she was crying, she suddenly felt a hand was softly caressing her head. She immediately looked at Xiah. He was already awake and was smiling at her. “Xiah . . . . .” she uttered with joy. “Iqa. . . . I could never leave you . . . .” he said with love in his eyes. “Xiah . . . . ” Moniqa said with joy in her eyes. “Xiah . . . . I thought I had lost you. . . . ” she said as she tried to control her tears. “I already told you . . . . You will never lose me . . . . for I am always with you. . . .in your heart,” Xiah said with a loving smile on his lips. Moniqa looked at Xiah with love in her eyes. “Promise me, you will never do something so foolish like that . . . .ever again. I don’t know what I would do if I lose you again.” she suddenly said as she tightly held Xiah’s hand. “Promise me that you will always be by my side . . . supporting me . . . . loving me . . . . guiding me . . . . and showing me the light . . . . Do you know while you were talking to me . . . . I was already going through a bright light . . . . But then I heard your voice . . . . Then I tried to find where it was coming from . . . . And that was when I noticed a small star . . .twinkling . . . . Your voice was coming from that star . . . . I heard everything you had said. And while I was listening . . . . I followed that star into a dark path . . . . I knew your love was going to lead me back to you . . . . And I was right . . . . . I love you Iqa . . . . And I promise I will never . . . . ever leave you alone again,” Xiah said with such strong emotion visible in his eyes. As Moniqa and Xiah were lovingly talking to each other, Se7en and the other DBSK boys suddenly entered the room. They were all amazed to find Xiah conscious and smiling happily.They couldn’t explain the joy and relief that they were all feeling. “Hyung . . . . ” Max exclaimed with joy. Xiah just smiled at his friends. He was very happy to have another chance at life and . . . . at love. And he was determined that he wasn’t going to make any mistakes again. As Se7en and the other DBSK boys watched Iqa and Xiah together . . . . they all knew that love was the thing that had brought their two friends back together in each other’s arms. “I love you, Iqa. . . . From now on, I will never let you go,” Xiah softly whispered to Iqa. Moniqa suddenly smiled. She gently kissed Xiah on his lips. “I love you Xiah . . . .and I promise to be always be by your side,” she sweetly said back to him. A month passed . . . .
“Hyung . . . . ” Max called out. Xiah suddenly opened his eyes. “What?” he asked while his eyes were still closed. He was still very sleepy and he wanted to sleep some more. “You’re supposed to go on a date with Iqa today right? ?” Max asked with a raised eyebrow. Xiah suddenly opened his eyes. “What? What day is it today?” he asked as if somehow confused. Xiah immediately got out of bed. Then as he was about to go out the room, Moniqa entered with Jaejoong, Micky and U-Know behind her. “Wake up . . . . sleepy head!” Moniqa said with a big smile on her lips. “Hey! I am already awake . . . . See!” Xiah answered with a grin. “Don’t tell me you forgot about our date today? . . . . Because if you did . . . . Well, I certainly have to punish you . . . .” Iqa said with a pout. “My princess eh? You’re making sweet talk now?” she suddenly laughed. “Sorry . . . .” Xiah suddenly said seriously. “Your punishment would be . . . . to hug me whole day long,” she said with a laugh. “That isn’t a punishment . . . . but a treat,” Xiah said as he suddenly grinned. “Hey! You guys are already too sweet . . . .ants would surely love to get their hands on you,” Micky said as a joke. “So Xiah . . . . are you ready to go yet?” Moniqa asked impatiently. The other DBSK members suddenly burst out laughing. Moniqa laughed as well. . . . . but then she started pinching Xiah. “You naughty boy . . . . ” she said as she gently pinched him on the arm. “Just give me fifteen minutes okay?” Xiah said to Moniqa with a sweet smile. “Okay . . . Hey . . . . Jaejoong . . . Micky . . . Max . . . U-Know . . . . Would you guys like to come with us?” Moniqa suddenly asked the other DBSK boys. “What? Us? Are you sure?” Jaejoong asked with a surprised expression on his face. “We certainly don’t want to intrude,” Micky added. “Hyung . . . . won’t like it if we tagged along,” Max said with a smile. “Don’t worry . . . . I assure you . . . it would be fun. . . And besides . . . I know how much he loves you guys . . . . So I think he won’t mind if you guys came along . . .” she answered. “No . . . it’s okay . . . We certainly would be a bother to both of you,” U-Know said. The other DBSK boys all looked at Xiah. “Don’t worry about me . . . . I would like you guys to come along too. The more . . . . . the merrier . . . .” Xiah said with a grin. “Yes!” Max suddenly exclaimed. He really wanted to come along, but was just too shy to say it. Both Moniqa and Xiah smiled. They were very happy seeing their friends happy faces. An hour passed, Moniqa and the DBSK boys were already on their way to their destination. “Where are we going Iqa?” Xiah asked as he looked out the van. “It’s a secret!” she answered with a giggle. Xiah looked at the other DBSK boys. They were all very curious as to where they were going. Another hour passed and the van finally stopped. “Where are we?” Micky asked suddenly. The DBSK boys immediately noticed the different vehicles parked outside the big mansion that they were infront of. “This is Masao’s house . . . . If you can call it a house . . . .” she said with a grin. “Why are there so many cars here? Is there a party going on?” Jaejoong asked curiously. “Yup . . . That’s why I wanted you guys to come along . . . .” she answered with a grin. Micky’s face suddenly lit up with excitement. “So there are a lot of models here . . . now?” he asked with a big smile on his face. “Yes . . . .” Iqa answered. “I totally love this place!” Micky suddenly exclaimed. The DBSK boys just followed Moniqa inside the Masao’s mansion. And as soon as they entered the mansion, they were immediately greeted by several gorgeous women. “I love this place!” Micky said with a big smile on his face. He couldn’t decide where to look. There were models scattered everywhere. As soon as the girls noticed the DBSK boys, they immediately approached them and started talking with them. “Hello boys . . . I see you’ve finally met my girls,” Masao said with a grin. “Yes . . . . they’re all very . . . . very beautiful,” Micky commented with a smile. Xiah just nodded and smiled. Moniqa and Masao then walked to a group of people already conversing in a corner of the room. Then Xiah and the other DBSK boys suddenly became preoccupied with the girls that were trying to talk with them. As time passed . . . . Xiah was already having fun talking with some of the female models that he had already forgotten about Moniqa. While Xiah was busy talking with the girls, Iqa was silently watching from afar. She was already very jealous. She was already pouting and fidgeting while trying to talk with some of Masao’s guests. Masao noticed Iqa and then he suddenly smiled. He then walked up to where Xiah and the other DBSK boys were and then he whispered something to Xiah. “Your girlfriend is already jealous . . . . Better get her out now . . . . I don’t want her to go mad with jealousy here . . . .” Masao said with a light laugh. Xiah worriedly looked at Moniqa. He noticed that she already had a strange expression on her face. He suddenly smiled sweetly. “My baby’s jealous . . . ” he thought to himself. Xiah politely excused himself from the girls he was talking to. And he hurriedly walked up to Moniqa. “How about we go out for some fresh air?” he softly whispered in Iqa’s ear. “I thought you already have forgotten about me . . . . ” Iqa said with a pout and as she glared at Xiah. Xiah suddenly laughed.”How can I possibly forget about my baby girl?” he asked and he gently pinched Moniqa’s cheek. The other people who saw Xiah’s gesture suddenly smiled. “You two love birds . . . . Better find some perfect place to talk,” a man said to both Xiah and Moniqa with a naughty smile on his lips. “Come on . . . . Let’s go . . . . I want to have some time alone with you . . . .” Xiah whispered again to Iqa. Moniqa smiled and just nodded. And she also excused herself from the people that she was talking to. Hurriedly Xiah and Moniqa went out of Masao’s house. Hand in hand, they ventured out into the wide and open space of Masao’s villa. Still holding hands. . . . Moniqa and Xiah walked into the open garden until they finally came upon a man-made lagoon. “This is so beautiful!” Moniqa suddenly exclaimed. She was taken by surprise by the sight before her. “Yes . . . It is very captivating . . . .” Xiah agreed. He was also very attracted to the beautiful sight he was looking at. It was already night time and the moon was shining brightly in the sky. While the moon’s reflection on the lagoon’s water was somehow illuminating everything around the lagoon. The scene was totally breathtaking. It was like a scene out of a magazine cover, that had suddenly became a reality right before their eyes. Xiah and Moniqa gently sat down, beside each other, on the upper side of the lagoon. They were both looking over the spectacular sight before them. “The last time I went here . . . maybe a year ago. This place wasn’t here before . . . . So Masao must have made this new improvement to his place a few months ago . . . .” she said with a sigh of awe. “Romantic? Me? I’m a born romantic . . . .It’s just that I don’t easily show it to anyone,” he answered with a sweet smile. Xiah looked at Iqa with a hurt look on his face. Moniqa suddenly stopped laughing as soon as she saw the look on Xiah’s face. “Oh . . . . I’m sorry . . . Xiah. I didn’t mean to offend you or anything . . . It’s just that I am not used to seeing you being so romantic and all . . . . ” she said apologetically. “So you mean you don’t like me to show you how much I love you?” Xiah asked with a strange expression on his face. “Don’t worry . . . . You will meet him. He is also very much interested in meeting you,” Xiah said with a smile. Moniqa suddenly release Xiah from his embrace and then she leaned against Xiah’s shoulder. “Can we be like this forever?” she asked suddenly. Xiah looked at the sky . . . . then she slowly stared at Iqa as she was resting her head on his shoulder. “Yes . . . . we can . . . . if you like,” he answered. Moniqa raised her head and stared at at Xiah for a few minutes. . . . then she suddenly took Xiah’s hand and held it between her two hands. “Why do I suddenly feel that you’re going to say something that I won’t like?” Xiah said as she tried to hide his fear with a smile. Xiah’s smile totally disappeared the moment he heard what Moniqa said. “Then I don’t want to hear it!” he said as he looked at the lagoon. “Xiah . . . .” she softly uttered his name. “Whatever it is . . . the answer is no,” he replied with a serious expression on his face. “Xiah . . . . how can you easily say no to something you haven’t heard yet?” she asked with a sweet smile. Xiah stared at Iqa’s eyes. “I’m afraid . . . .” he uttered. “Afraid of what?” Moniqa asked surprisedly. “Of you . . . . leaving me,” he replied with a weak voice. Xiah was very surprised. He didn’t want Moniqa to be away from him even for one day. How was he going to survive two weeks without her. “Two weeks?” he asked with a surprised look in his eyes. He then hugged her from behind. He embraced her so tightly that Moniqa suddenly felt pity for him. “Xiah . . . . Don’ be like this . . . . please,” she softly said. “But I don’t want you to go . . . . I can’t live without you . . . . ” he said again. “Xiah . . . . I’ve been gone from the Philippines for more than three months now. I have left so many unfinished commitments that its already driving my manager crazy. I have to take care of those responsibilities . . . . Baby, please try and understand,” she said as she gently held his hand. Xiah looked out at the lagoon again. He didn’t know what to say. He understood Moniqa’s situation and the reason why she had to leave. But he was still reluctant to be away from her . . . . His heart was too afraid to let her go. “I understand why you must leave. But like I’ve said before . . . . I’m scared,” he softly uttered. Moniqa leaned her head on Xiah’s chest and tried to snuggle comfortably in his arms. She leaned on his chest . . . that she was able to hear his heart beating. Xiah’s heart was beating hard and very fast. Moniqa’s heart was also beating fast . . . and was also aching. She didn’t want to see him so sad. But there was nothing she could do. Xiah placed his head beside Iqa’s head. He then lovingly kissed her head. He was so close to her that he could smell the scent of her hair and he could feel the warmth of her body. He was somehow feeling a strange sensation building up inside his body. A sensation he had never felt before. “So . . . you’ve already made up your mind . . . . And I guess I can’t stop you anymore,” he said with a sad voice. Moniqa was suddenly regretting that she had told Xiah about her trip back to the Philippines. This was supposed to be their very first official date after the accident . . . . They were supposed to be happily spending time with each other. “Xiah . . . . Please . . . . two weeks . . . . just give me two weeks . . . . I’ll try to settle everything as fast as I could . . . . And as soon as I am finished, I’ll come back here . . . . . I’ll come back to you,” she tried to reassure him again. Xiah tried to smile. “Frankly . . . .I know I’m being selfish . . . .So don’t worry about me. You just do what you have to do. And just try to finish everything at your own pace. Don’t try to over work yourself just because of me. You’re still trying to recuperate from your surgery. So don’t try to hurry everything . . . . just do all your commitments, one at a time. I wouldn’t want you to suddenly get sick or anything like that . . . .” he said with concern. “So when are you leaving?” he asked with a low voice. “The day after tomorrow . . . .” she replied sadly. “So that means I only have until tomorrow . . . . to be with you . . . .” he gently uttered. Xiah’s face suddenly lit up with joy. “Really? So we will still be together tomorrow?” he asked joyfully. “Yes . . . .” Iqa replied with a smile on her lips. Xiah embraced Iqa tighter. They were both silent for a few minutes as they stared at the lagoon before them. “Yesterday . . . I went to see the family of the girl who donated her heart to me,” she replied. “Yes . . . . I talked with them and they were very nice. She was involved in a car accident as well,” she replied. “Iqa . . . please don’t feel that way. It’s not your fault she died . . . And it’s not your fault that her parents gave you her heart . . . You shouldn’t be feeling guilty, but instead you should be happy. I think you should try to live your life to the fullest . . . .that way you can show her family that their decision was right . . . . and that her death wasn’t all in vain,” Xiah tried to comfort Iqa. “Yes . . . . you’re right . . .” she replied with a sigh again. “Please don’t be sad . . . I hate seeing you sad,” Xiah uttered. “Uhmm. . . .” he uttered. “While I’m gone . . . . Promise me . . . one thing,” she said softly. “You won’t look at other women,” she quickly replied. “Because . . . frankly . . . I am also afraid to leave you . . . I’m afraid that when I’m in the Philippines, you would suddenly meet a new girl and you would forget all about me . . . .” she answered as if somehow depressed. “Honestly . . . . I am a bit insecure . . . . All your wounds have already healed perfectly. It’s as if you were never involved in a car accident . . . . You’re back to the same cute and adorable Xiah. While as for me . . . not all my wounds have healed perfectly. I already have so many scars . . . I am quite embarrassed to wear skirts or show off my arms now. . . . That’s why . . . while you were talking to those models, I was feeling very jealous. You easily attract any woman’s attention . . . . And that is what I am most afraid of . . . . compared with those models . . . . I am nothing now,” she confessed. Xiah looked at Iqa’s face. Then he gently kissed her on the forehead. “You don’t have to be worried about anything . . . . I am yours . . . all yours . . . .I will never give my heart to any other girl except you,” Xiah said with a sweet smile. “Ssshhh. . . . .” Xiah gently placed his finger on Moniqa’s lips to stop her from talking. They both looked into each other’s eyes. . . . and they finally saw the love that they were desperately searching for. They knew right at that moment . . . . nothing could keep them apart . . . . not time . . . nor distance. Xiah suddenly smiled. “It’s already cold . . . . I think we should go in now . . . .” he softly said as he saw Iqa control her shiver due to the cold breeze. Iqa nodded. “Maybe they are already looking for us . . . .” she agreed. As Xiah and Moniqa and went back into the mansion, they immediately noticed that it had suddenly became very quiet. They entered the mansion quite puzzled. Then they found a note waiting for them on the door leading to the living room. We went out to a club . . . . We know that the two of you needed some time alone so we didn’t invite you along. We will be late in coming home so don’t wait up. Hope the two of you will have your special time together. “Why?” Iqa asked quite puzzled with Xiah’s sudden laugh. “Nothing . . . . It’s just that your friend Masao is really something . . . .” Xiah answered. “So . . . . I have you all alone tonight . . . .” Xiah with a smile. “Are you really happy that you’re stuck here with me . . . . while all your friends are out partying with those gorgeous girls . . . .” Moniqa teased. Xiah just shook his head. “No . . . . not the least envious . . . .” he replied with a sweet smile. Moniqa’s heart was totally touched with Xiah’s words. She could feel the deep love that he had for her. And it was bringing her so much happiness that she had never felt before. “Xiah . . . . .” she softly uttered. They were already facing each other now. Their eyes were somehow in a trance. Deep in each other’s eyes they saw love. . . . . love that they both knew was going to last forever. Xiah slowly started to lower his head. And he gently brushed his lips with feather-lightness over hers. Their lips met and somehow it made them totally forget about all their worries. They loved each other and it was the only thing that was important right at that moment. Xiah’s kiss was very gentle at first . . . . but as time passed his kiss became more exploring and more passionate. Iqa didn’t stop him. She wanted to remember their kiss. They were being pulled into an overwhelming emotion that both of them had never felt before. As Xiah and Iqa continued to share their special moment together . . . . it was as if the time inside the mansion had suddenly stopped . . . They didn’t have any worries or fears . . . .all they had at that moment was the love for each other . . . .While outside . . . . the moon continued to shine and the cold breeze continued to blow. They knew that nothing was going to separate them . . . . ever again. Se7en, Masao and the DBSK boys were all in the airport, Moniqa was already going back to the Philippines and they were there to send her off. Xiah had been very silent all throughout the trip to the airport. Moniqa had already noticed his behavior, but just decided to let him be. The time had finally come to say goodbye . . . . .
“Take care of yourself okay?” Masao said with to Iqa with a smile. “You don’t have to worry about me . . . .” she replied with a smile as well. “We always worry about you . . . . You always end up being in trouble . . . .” Se7en commented with a wide grin on his face. “Don’t forget to take care of yourself. Remember you’re not fully recovered yet . . . .” Masao added. “Don’t overwork yourself . . . .” Max added as well. “Remember . . . . to always be careful and always remember to take your medicine,” U-Know reminded Iqa again. “And please . . . . while you’re in the Philippines . . . . avoid drinking wines or any kind of alcoholic beverages,” Micky said seriously. Se7en, Masao, Jaejoong, Max and U-Know all nodded in agreement to what Micky had said. Moniqa smiled. They were all concerned about her, she thought. “And always eat on time and try to eat a balanced diet . . . . and make sure the food you eat is low in cholesterol and rich in fiber,” Jaejoong suddenly said to her. Iqa suddenly laughed. She was very much amused with what Jaejoong said. “Yes . . . . Mother Jaejoong . . . . I won’t forget everything you said,” she said as a tease. Everyone who heard what Moniqa said laughed . . . . . except Xiah. He was hurting very badly to even care about what they were talking or laughing about. Moniqa looked at Xiah’s sad face. Her heart was somehow being slowly torn into pieces as she watched tears start to form in his eyes. “Xiah . . . .” Moniqa uttered. She had been trying to ignore the sadness she was seeing in his eyes. She was afraid that if she gave in to her emotions, she would just decide to forget all about her obligations back in the Philippines. And that she would just decide to stay in Japan together with Xiah. Moniqa closed her eyes. She wanted to stop the tears that were already trying to escape from her eyes. She was also very sad. She didn’t want to leave Xiah. She was also very scared that once she left him . . . . he might suddenly find someone new. And she certainly didn’t want that to happen. She would just die if something like that would happen. “Xiah . . . .” she slowly uttered again. She had opened her eyes and now was looking at Xiah’s face as tears flowed down his cheeks. “Iqa . . . .” he said her name. “Xiah . . . . Don’t cry please . . . . You’re going to make me cry too,” she said as tears fell from her eyes as well. Xiah couldn’t control his emotions any longer. He immediately walked up to Moniqa and he suddenly embraced her tightly. He embraced her like he wasn’t going to let her go ever again. “Xiah . . . .” she cried. “Please don’t go . . . . I don’t know what I would do without you . . . . Please . . . .’ he cried. Moniqa’s heart was aching. She couldn’t stand hearing and seeing him so sad. She embraced him tightly as well. She wanted to feel the warmth of his body. She wanted to keep the memory of it locked up in her heart. “Xiah . . . . I’ll only be gone for two weeks . . . . It’s not like I’m never going back here . . . ” she tried to explain. “No . . . . I don’t want you to go . . . . I want you always by my side,” he said between sobs. “Oh . . . . Xiah . . . . You’re an artist as well . . . . You should know all about the obligations an artist has. . . . I have to settle all my commitments, Xiah . . . . please,” she said softly. “Are your responsibilities more important than me?” he suddenly asked as if hurt. “No . . . . you’re the most important thing in my life . . . But you know I also have to be responsible for other things and other people. I have to take care of them too . . . ” she answered softly. Xiah gently nodded. He understood Moniqa. The only problem was that his heart was unable to accept the fact that she was leaving him. “Xiah . . . . It’s only two weeks . . . . after that she’ll be back. . . . Believe me, you won’t even notice the days as it passes by,” Masao said to Xiah. “I’m sorry . . . .if I’m being unreasonable and selfish,” Xiah said to Moniqa. Iqa suddenly smiled and cupped Xiah’s face with her two hands. “Xiah . . . . I promise . . . . I’ll be back and when I return. . . . I will never leave your side again. So please try and understand . . . . I can’t go while seeing you like this. It’s breaking my heart baby . . . . please. . . .” she said softly. “Promise me that you will always think of me . . . .” he said with a smile. “I will miss you too Xiah. Please take care of yourself,” she replied. “Call me whenever you’re free . . . okay?” Xiah asked with a sad look in his eyes. “Moniqa . . . . . It’s time to go,” Moniqa’s manager suddenly announced. She looked at her manager and then looked at everyone around her. She smiled. Then she walked up to Masao. “Take care of yourself, Masao,” she said as she gently kissed him on the cheek. She then approached Se7en. “Goodbye Dong-Wook . . . . I’ll be seeing you again in two weeks all right? Take care of yourself . . . .” she then kissed him on the cheek as well. Lastly she approached the DBSK boys. . . .
“What is it?” U-Know asked. “Can you guys take care of Xiah while I am gone? Can you make sure that he doesn’t miss me so much?” she asked with a smile. “Don’t worry about him. . . . We will surely take care of him,” Micky answered with a grin. “We will be keeping an eye on him. So don’t worry about him while you’re in the Philippines. Just try to finish everything you’re supposed to do and hurry back here,” Jaejoong said with a sweet smile. “Thank you very much guys . . . . I already owe you so much . . . .” she uttered. “Oh . . . Don’t mention it . . . . We are doing it because we all like you. And we know how much hyung loves you . . . .” Max said with a grin. “So I’ll be going . . . . Thank you again,” she finally said before kissing the four DBSK boys on their cheeks. “Moniqa . . . . We have to go . . . .” her manager impatiently said. “Yes . . . . I am coming . . . .” she said. Lastly . . . Moniqa faced Xiah with sad eyes. “Xiah . . . . so I am going now . . . . Please take care of yourself while I am gone. I promise I will call you and I will always think of you,” she said with a trembling voice. Somehow her tears were starting to form again in her eyes. Xiah quickly drew Iqa closer to him. . . . and then he kissed her passionately. He wanted her to remember him by their last kiss. As they kissed, it was as if the world started to spin around them. They felt like they were the only people left in the world. They didn’t want to be separated from each other. But they knew they had to do it. How they wished that time would suddenly stop so that they can be together longer. But as their kiss finally ended . . . . tears were already falling from their eyes. Xiah wiped away Moniqa’s tears . . . and she wiped his tears in return. “I love you . . . .” he whispered. “I love you too . . . .” she replied. Moniqa quickly turned her back on him. She didn’t want him to see her tears. She didn’t want him to see her sadness. Xiah just watched as Iqa slowly disappeared from his sight. His heart was breaking into pieces. He didn’t want her to leave him. But he just tried to console himself with the thought that she will be back in two weeks time. “I love you Iqa . . . . And I will be waiting for you until you return back to me . . . .” Xiah said in his mind. A month passed . . . . .
Xiah sighed heavily. He was tired and he needed a break. They had been busy with interviews, TV guesting and rehearsals for Moniqa and Se7en’s most anticipated concert. Xiah looked out the window of the room they were in. Yes . . . he was tired but what was really making tired wasn’t the physical strain. . . . but the emotional one. “Hyung . . . . are you all right?” Max asked with concern. Xiah tried to smile. “Yes . . . . don’t worry,” he replied. “You look quite tired . . . .” Micky commented. “It’s because he hasn’t been getting much sleep lately,” U-Know said suddenly. “Because of Iqa?” Jaejoong asked again. “You really do miss her badly . . . .” Max commented. “But she calls you almost every other day . . . . And she’s already explained to you why she’s still in the Philippines right?” Jaejoong said while trying to point out Moniqa’s side. “Yes . . . . I know . . . . And I understand. . . . But I still can’t help it . . . . I miss her . . . . I miss her badly. . . It’s like whenever I close my eyes, it’s her face I imagine. And whenever I open my eyes, it’s also her face that I am hoping to see,” Xiah said sadly. “Xiah . . . . don’t worry. Her concert with Se7en will be next week. So she will certainly be here this week. Try to cheer up okay?” Micky said with a smile. “I can’t help it . . . .” Xiah uttered hopelessly. The other DBSK boys just looked at each other. They wanted to help their friend. But they didn’t know what else to do. “Okay boys . . . . Let’s start from the top . . . .” the dance choreographer announced. The DBSK boys suddenly stood up and continued with their practice. After an hour . . . . they were on a break. Xiah was feeling very lonely as usual. He then started to sing . . . . .
Everyone in the room just watched and listened to Xiah sing. He was obviously very emotional. And all of them could feel the loneliness in his voice. He was already half done with the song when . . . . .
“Is that song dedicated to me?” a sweet voice suddenly asked. Xiah looked at where the voice came from . . . . It was Moniqa. She was standing near the door with a sweet smile on her lips. Xiah didn’t know if what he was seeing was real or just a figure of his imagination. He just stood staring blankly at Moniqa for several minutes before finally realizing that she was really standing in front of him. “Iqa . . . . . ” he suddenly screamed with joy after finally realizing that she was really in the room with him. Then he hurriedly ran to where she was. Moniqa smiled and waited for Xiah with open arms. As soon as Xiah was close to her . . . he immediately carried her into his arms and started to swing her around the room. Xiah was very happy. Iqa was finally in his arms again. Somehow all his worries and fears suddenly disappeared the moment he saw her again. “I missed you baby. . . . ” he said happily. “I missed you too . . . . ” she replied. Xiah had put down Moniqa and was now just embracing her tightly. “Why didn’t you tell me you were coming today?” he asked with a pout. “I wanted to surprise you . . . .” she replied sweetly. “I was really starting to miss you badly . . . .” he said again. “I know . . . . your friends told me that you might get sick or something if I didn’t come back as soon as possible . . . . So here I am . . . . I was really worried about you,” she said as she gently touched his face. Xiah held Iqa’s hand that was touching his face. “I was also very worried about you . . . . You said you would only be gone for two weeks . . . . but your two weeks suddenly became a month . . . . I was starting to wonder when you were really coming back . . . .” he said with a low voice. Xiah’s face suddenly lit up the moment he heard what she had said. He couldn’t explain the joy he was feeling. Moniqa was going to stay with him and was never going to leave his side ever again. . . . the thought was causing him intense happiness he had never felt before. Xiah gently lowered his head and started to kiss Iqa. Everyone in the rehearsal room , especially Jaejoong, Max, Micky and U-Know, suddenly applauded and screamed. They were all delighted that Xiah and Moniqa were finally together again. One week later . . . . Moniqa and Se7en’s concert day . . . .
“Hurry up guys . . . . .” one of the staff members said to the DBSK boys. They were already about to perform. The DBSK boys entered the stage and the crowd started to scream. Then they started to sing. I believe…I believe that one can fall in love at first sight, though I told you that it wasn’t possible. I believe in you…I will send all my feelings for you through the the way I look at you. Do you know how my heart feels, how I want to keep the feelings I have for you hidden? Please keep looking at me with the same eyes…always and forever like this. Love moves… in mysterious ways…. As soon as Moniqa finished with her song Xiah suddenly appeared. She was very surprised because she knew that he wasn’t supposed to perform after her. She was very confused . . . . But Xiah just continued to smile and then he started to sing . . . . .
Xiah gently took Moniqa’s hand and held it tightly as he sang. The fans in the stadium were already screaming wildly. Everyone was ecstatic with the sweet scene that was happening in front of them. As soon as the song was finished, Xiah softly kissed Moniqa on the lips in front of the thousands of fans screaming. The crowd grew wild after seeing Xiah kiss Moniqa. Moniqa was touched and also shocked with Xiah’s sweet gesture. But she didn’t expect the next surprise that Xiah had planned for her. Xiah suddenly knelt down in front of Moniqa and took out a small box in his pocket. Then he gave it to her with a very sweet smile on his lips. Moniqa’s heart was pounding wildly. She already had an idea what was inside the box. But she was still having doubts. With trembling hands . . . . she took the small box from Xiah and nervously opened it. Then as she expected . . . . right in front of her eyes . . . . was a diamond ring. “Xiah . . . . .” she uttered in total confusion. She looked straight into his eyes as if asking what was going on. Xiah smiled. “I love you . . . . I don’t think I can live without you . . . I want you to be always by my side . . . . That’s why . . . . I want to ask you . . . . Would you marry me? . . . . I know I still have a lot to learn about love and being a good husband but I am willing to learn . . . . If you would give me the chance . . . . Please say yes . . . . ” he said with sweet smile. “But . . . . Xiah . . . Are you sure this is what you want? . . . . What about your career? . . . . Your fans? . . . . Your dreams? . . . .” Iqa asked. “The only thing that matters to me now is you . . . . I love you and I want you . . . I am willing to give up everything I have now just to be with you . . . . ” he said with love in his eyes. “Xiah . . . .” she uttered. She couldn’t explain the happiness she was feeling. “I love you . . . .” he uttered again. Tears started to fall from Moniqa’s eyes. She didn’t care about anything anymore. What she wanted most in the world was to be with him . . . . and she would never let this moment go. Suddenly happiness was very visible in Xiah’s face. “Yes . . . .” he happily exclaimed. Then he carefully took out the ring from the box and placed it in Iqa’s finger. Then he gently kissed her again. They were both very happy . . . . From that time on . . . .they were going to be together, no matter what happens. As the crowd in the stadium were all shouting and screaming . . . . . Moniqa suddenly whispered something in Xiah’s ear. “I suggest you try to learn how to be a good husband very fast . . . . And while you’re learning that . . . . I also suggest you try to learn how to be a good father too . . . . Because you’re going to be one . . . . about eight months from now . . . . .” she said with a sweet smile. Xiah looked at Moniqa with a shocked expression on his face. Moniqa just smiled at him and then he lovingly kissed her again. Two years later. . . . The DBSK boys were all busy playing with a little girl in the garden of Xiah and Moniqa’s new house in Japan. “Baby . . . . your mommy’s calling,” Xiah said to the little girl. “Mama . . . .” the little girl called out as she hurriedly ran to where Moniqa was. “So what has my baby girl been doing?” Moniqa sweetly asked the little girl. She lovingly carried the little girl in her arms and went to where the DBSK boys were all sitting. “What have you guys been teaching my princess?” she asked the DBSK boys with a smile. “Nothing . . . .” Jaejoong and Micky answered with a smile. Moniqa looked at Xiah. She was somehow asking him what they were really teaching the little girl. “Don’t worry . . . .We were just singing to her . . . .” Xiah said with a smile. The DBSK boys smiled. They were all very happy. Everything was going well for everyone of them. Xiah was happily married and their careers were very successful as well. There was nothing else they could wish for. “Come on little girl . . . . Let’s leave Mommy and Daddy alone for a while,” Micky said with a big grin on his face. “Hey . . . .” Moniqa said as a warning to Micky. “Just joking . . . .” Micky said with a grin again. Jaejoong. Max, Micky and U-Know all went into the house together with Star. While Xiah and Moniqa were left alone in the garden. Lovingly . . . . Xiah embraced Iqa. “Happy?” Iqa softly asked Xiah. “Yes . . . . very . . . . .” he replied. “Thank you . . . . Xiah . . . . .” she suddenly uttered. “Thank you for what?” he asked as if confused. “Thank you for entering my life and being with me these past two years . . . .” Iqa replied. Xiah smiled. “I should be the one saying that to you . . . .” he said again. “Don’t you regret marrying me?” she suddenly asked. Xiah made Moniqa face him. Then he slowly lifted her chin to face him directly. “Why are you suddenly asking me that? Do I make you unhappy? Do I make you feel that I am regretting the day I married you?” he asked continuously. “No . . . . It’s just that . . . .” she uttered. “I love you . . . . and I will always love you no matter what happens. So please don’t ever think that I am unhappy with you . . . . Because frankly . . . . you are the one who has made my life meaningful . . . . you and Star . . . .” Xiah said with love in his eyes. “I love you too . . . . Iqa. . . .” he said as he lovingly covered her mouth with his. They both knew that all the hurt and worries were already over . . . . and there were only love and happiness in their lives right now. 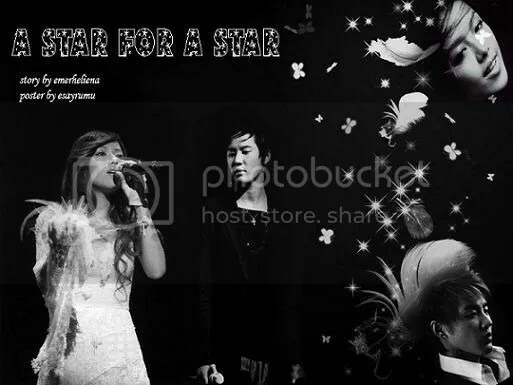 And no matter happens . . . . they will always be by each other’s side . . . . together with their daughter Star . . . .supporting and loving one another until the end of time.